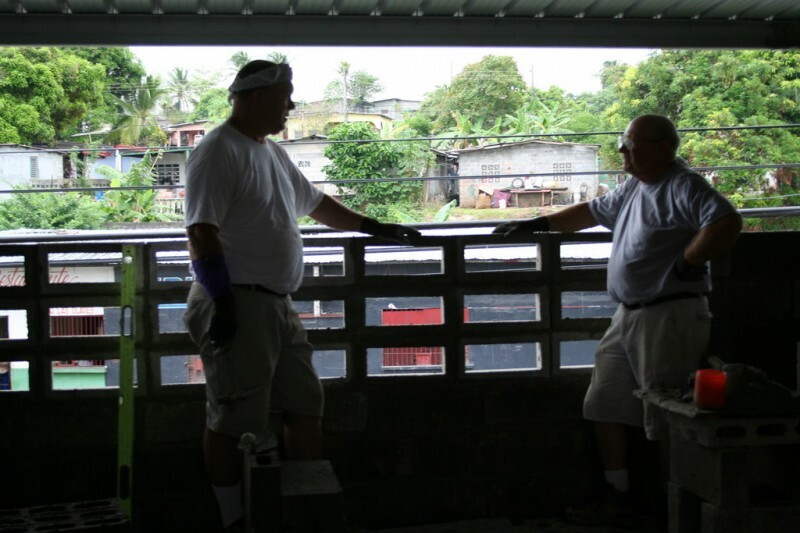 Recently I had the pleasure of going on a missions trip to Panama with my parents’ church, Portland Christian Center, for the fourth time. 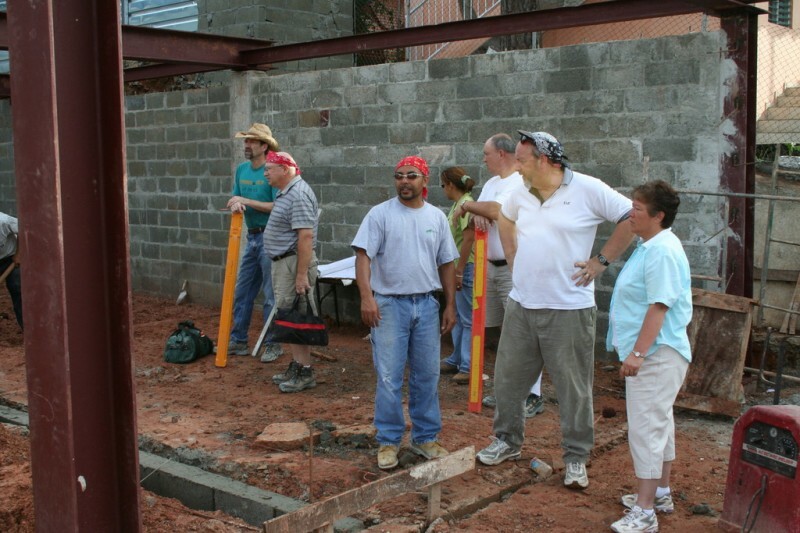 On this trip we were going to primarily work with Missionaries Rod & Sherry Boyd on the Jehova Jireh Good Shepherd School. 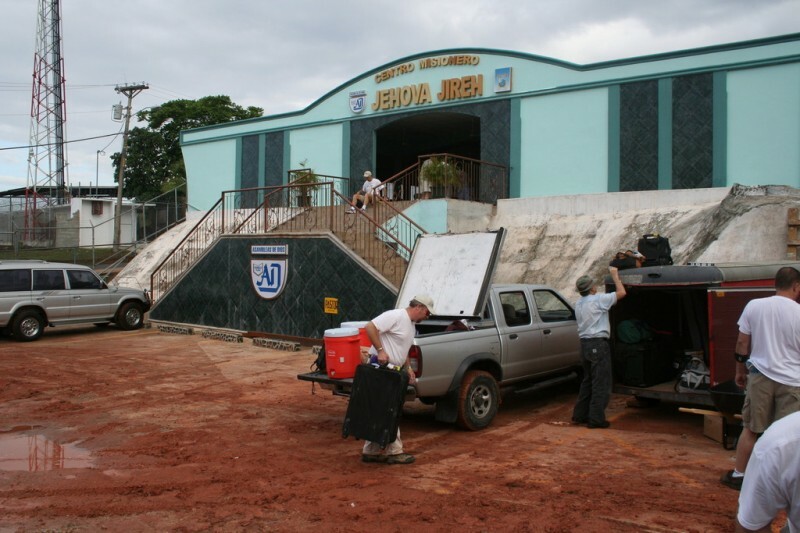 That school is an existing school started by the Jehova Jireh church and it currently has about 300 or so students. 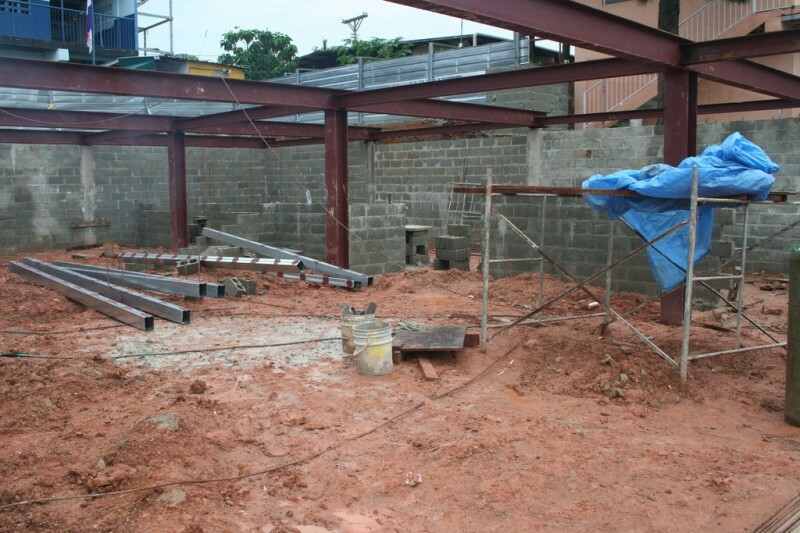 The new project is a three story addition that will expand the school’s capacity to around 600 students. 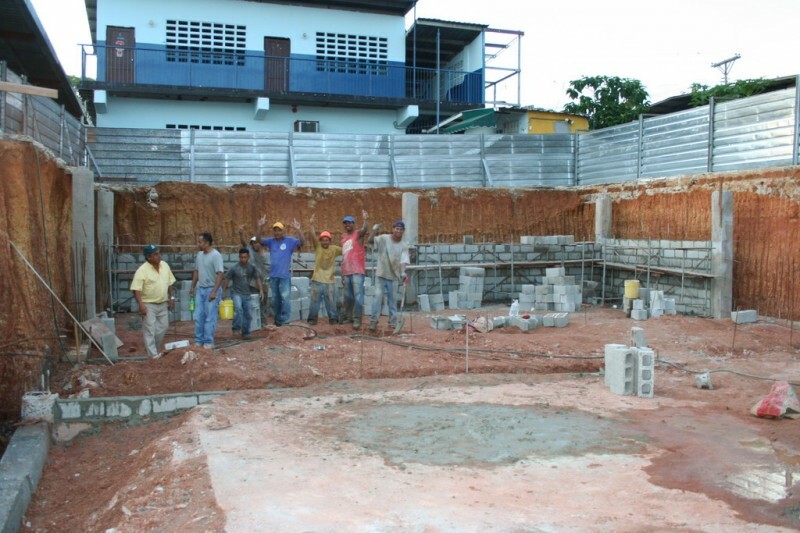 It ended up that we were able to spend three days also working on the Monte de Sion Buen Pastor school that we worked on originally in 2003, and that was a great blessing to us and hopefully to them as well. 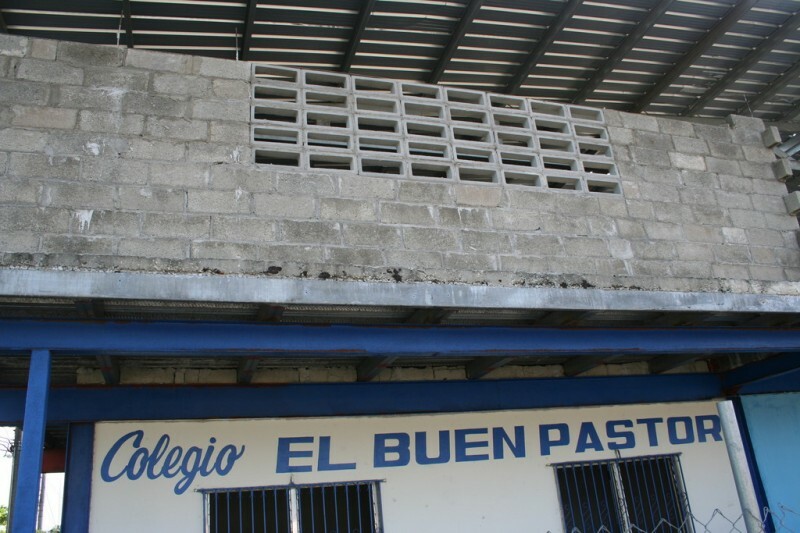 Both of these schools have an affiliation with an organization called Latin America Child Care that is a child sponsorship program that allows needy kids to attend these schools when matched up with sponsors who can help like you and I. It was a great trip and we got a lot done. I hope you enjoy the photos and the story. Thanks for reading. This is the first of a series of four photos that sort of form a panoramic view of the scene as we found it when we first arrived on Monday morning from right to left. 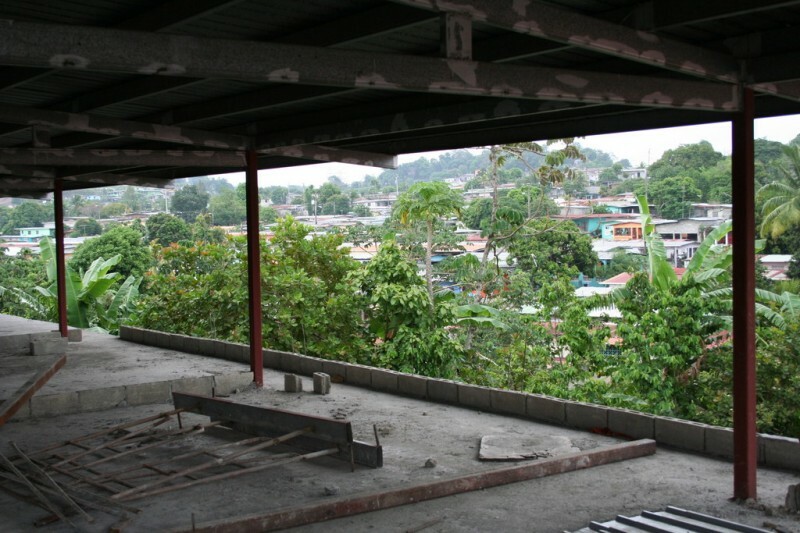 On the right you can see the right-most building of the existing school. 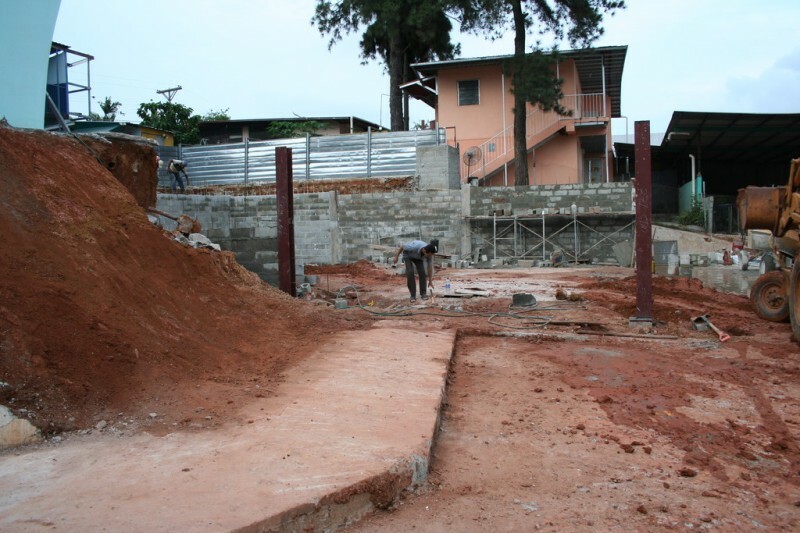 The rest of the school is behind the excavated site for the new addition that you see on the left, and to the left of that, attached to and behind the church sanctuary. 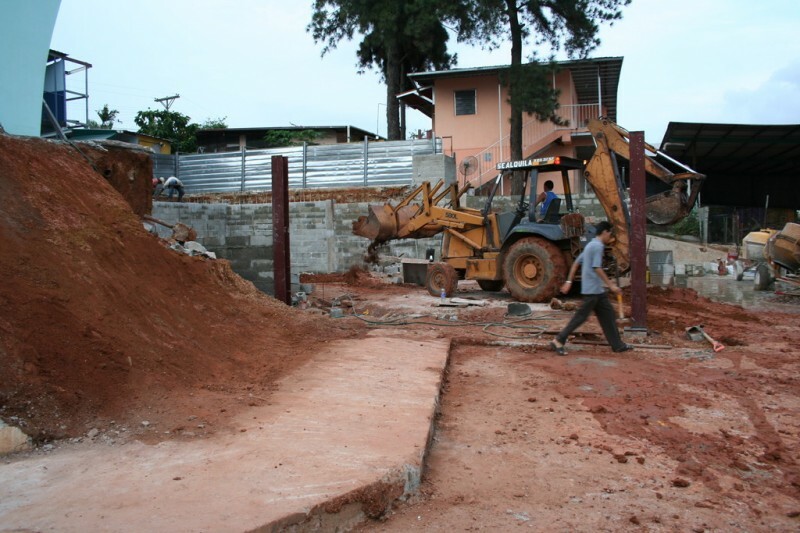 This shows the site where we are building the new addition. 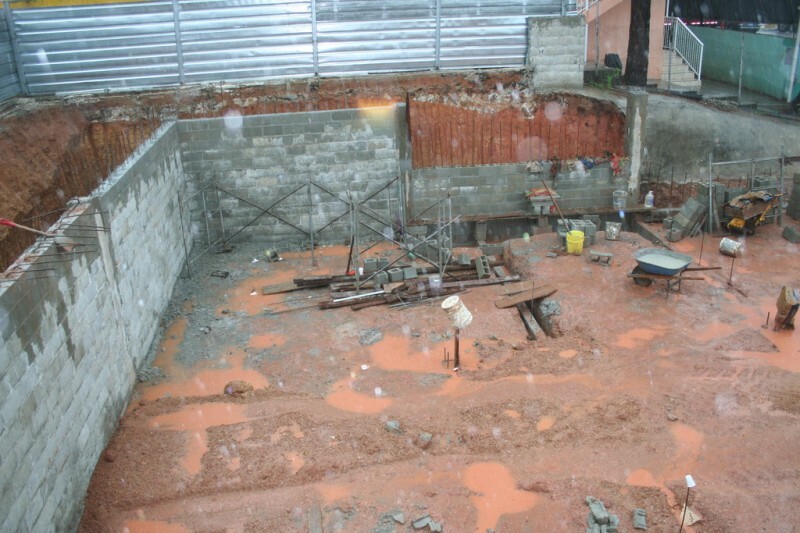 You can see the area had been excavated and columns and foundations had been poured. 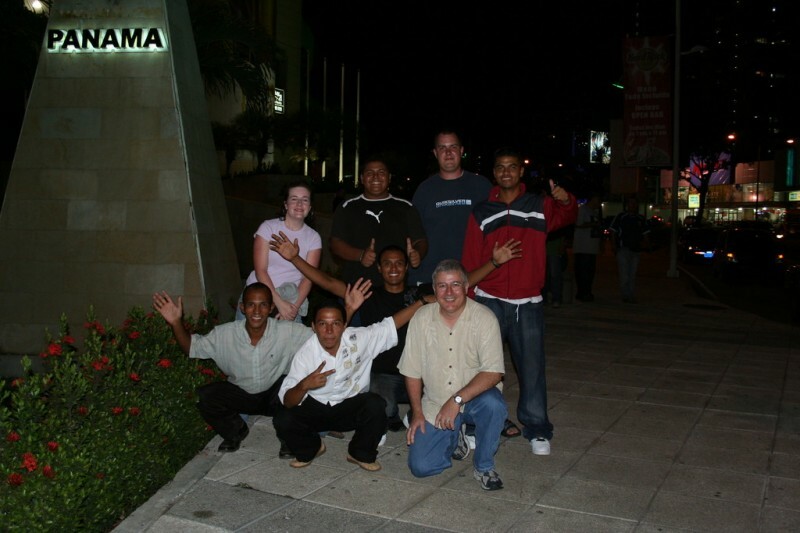 From left to right in the foreground (sort of) are the missionary Rod Boyd, David Martin (the leader of our group) and Francisco, who is originally from New York, but who now lives in Panama and works with Rod. We had met him on our previous trips to Panama. He's a great guy--all three of them are. On the left you can see the church affiliated with the school. From left to right again sort of in the foreground are Brad Hoskins, Dale Parish and Nate Wilhite. Here is a better view of the church. Doug Russell is getting tools out of Francisco's truck. Here is the view at the end of the first day. 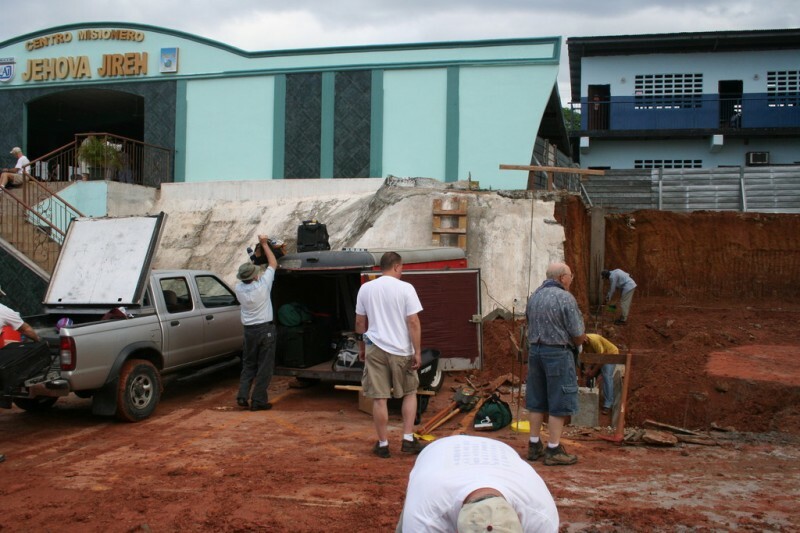 The Panamanian guys you see in the photo are part of a crew who are working for the engineer and have been working with us at least for the time being. 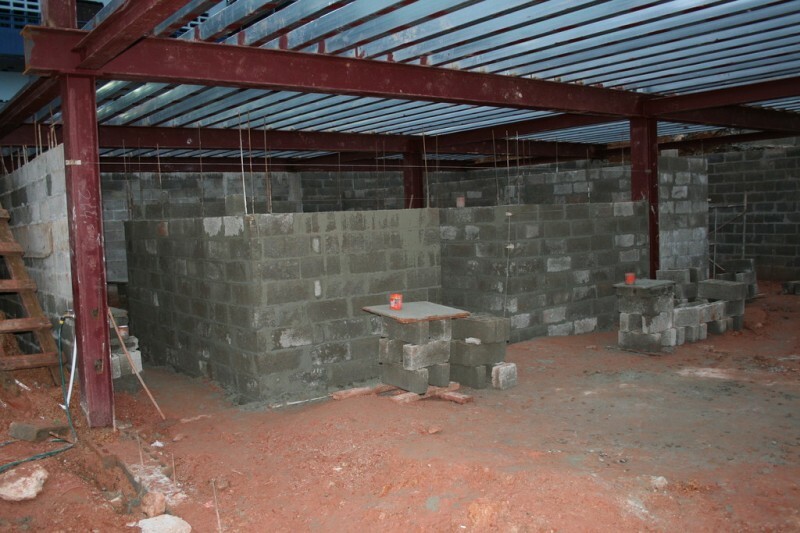 Later this week I believe they will be working to prepare the structure to pour the second story floor. 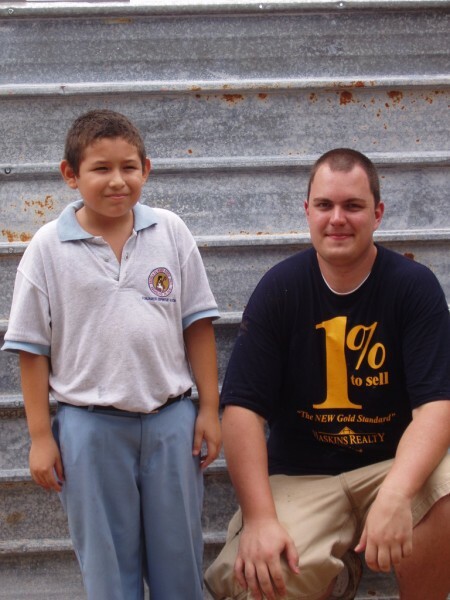 It's possible that while they are doing that we may move to a different school, Monte de Sion, where we worked last time we were in Panama. 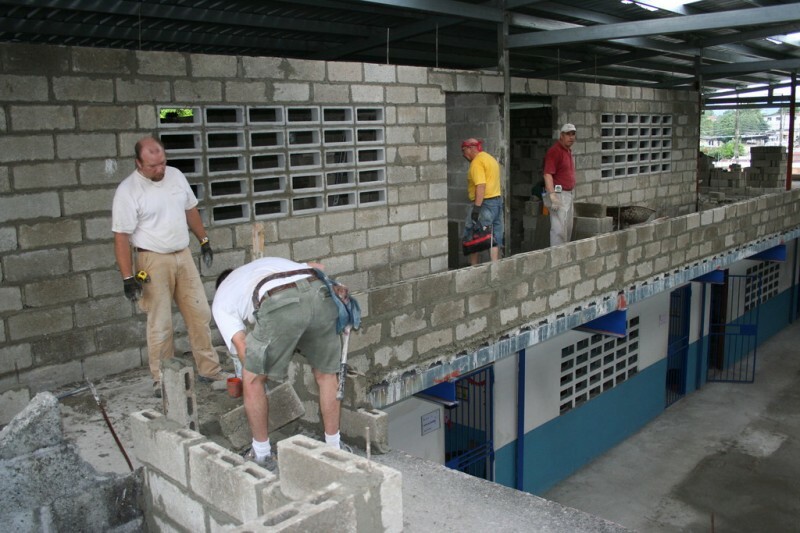 That would be really neat because they are really excited to have the help to finish the second floor so it can be used to allow more students to attend school. 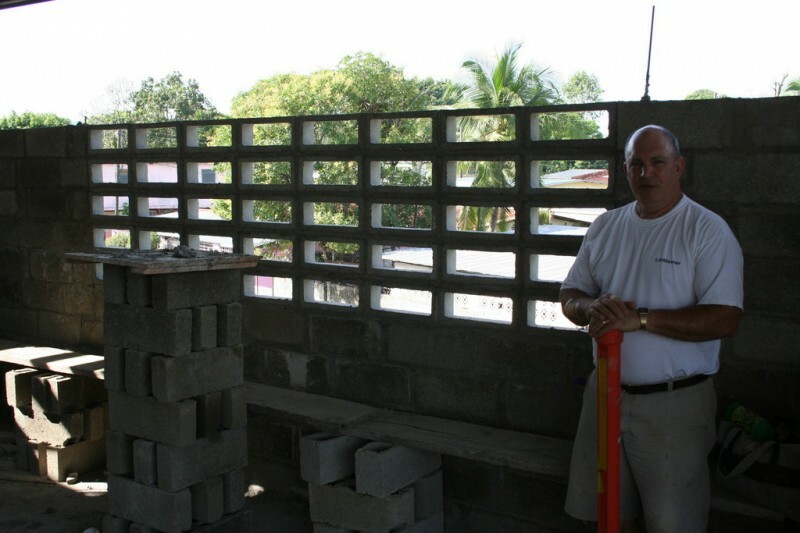 The wall on the right is the one my dad and I worked on during the first day. 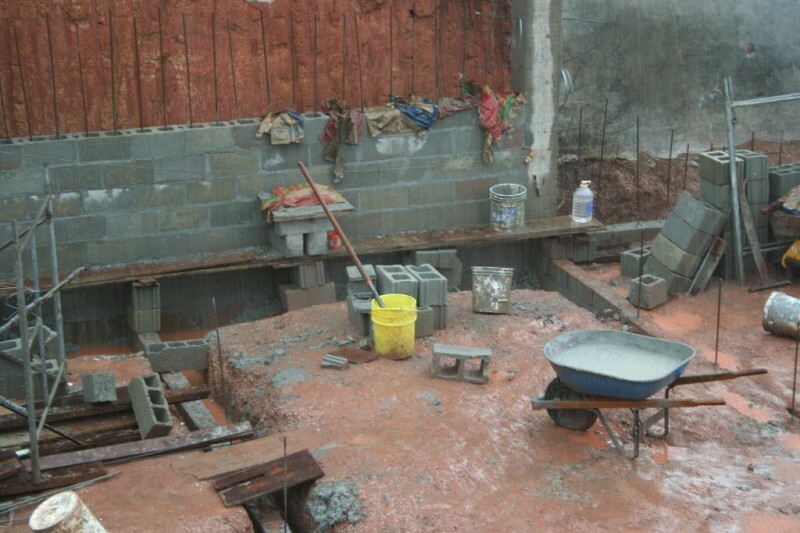 It was really slow going at first because, since it is a retaining wall, every cell is filled with re-bar and the whole wall is poured with concrete. Since then we have gotten more used to the process, but it is still fairly slow. Skipping ahead, this is the view at the end of the second day. 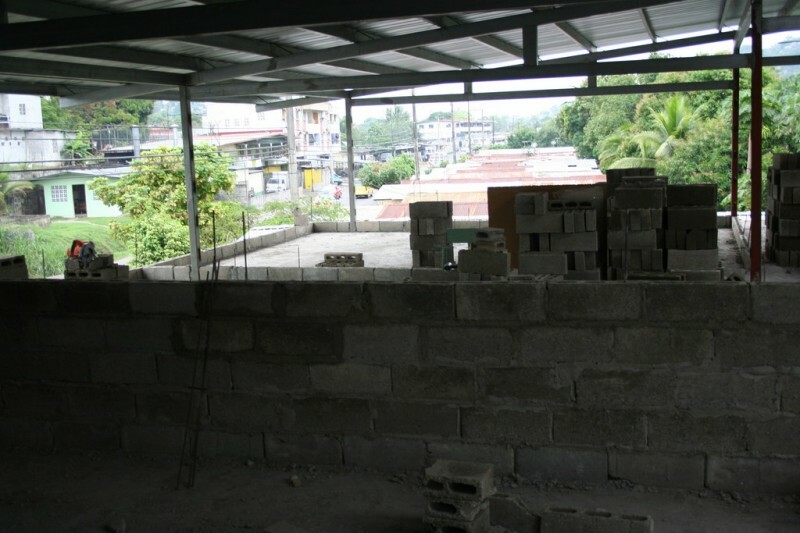 The back wall and the wall my dad and I were working on were finished, and we had just started working on the next wall on the right adjacent to the one we were just on. Somewhere between 2:30 and 3:30 a tropical downpour happened, and we had to abandon our work for the time being. 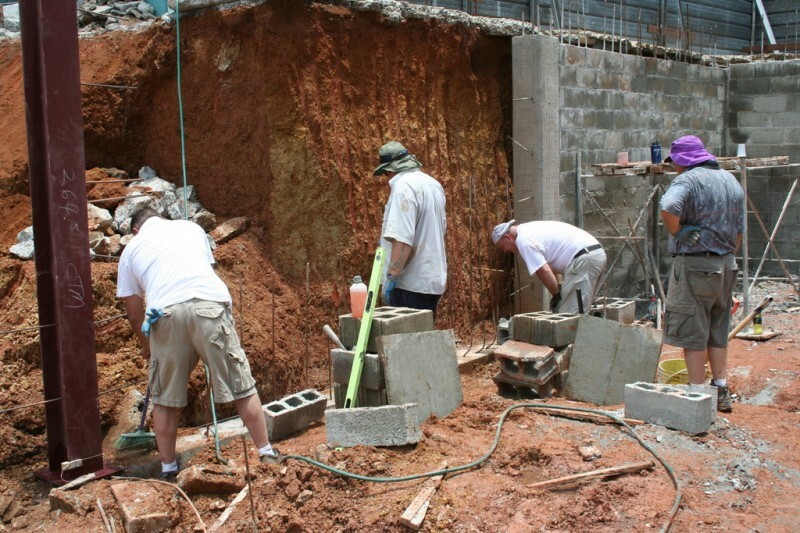 We had just laid down a bunch of mortar on top of the foundation to try to make up some height and to start our first course. 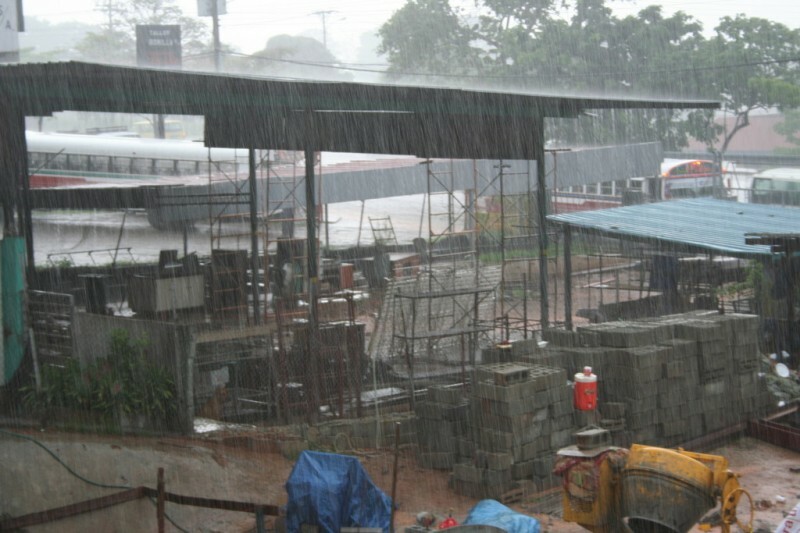 When the rain stopped, despite it all, the mortar was solid. This is a closer view of the wall we worked on. I know this is probably boring for you all, but for me I really like to see how I did. I'm not too proud of this one. 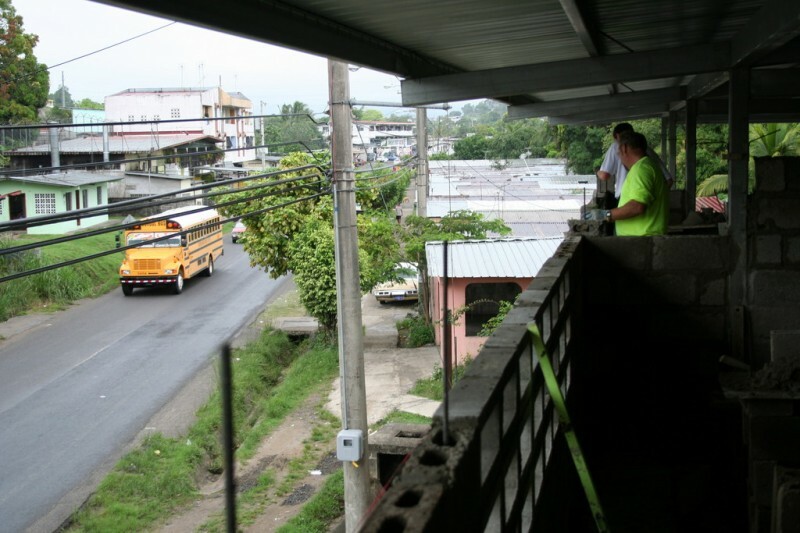 It was fairly difficult getting used to the re-bar and concrete in every cell as well as the heavier eight inch block and the hot humid weather. I think I have done better each day since we started. On Wednesday, about the same time as the day before, around 2:30 or so, the rain started again, and this time even harder. We knew it was coming from the feeling in the air. It feels so good when it comes. Anyway, we moved inside the church and school to wait it out. 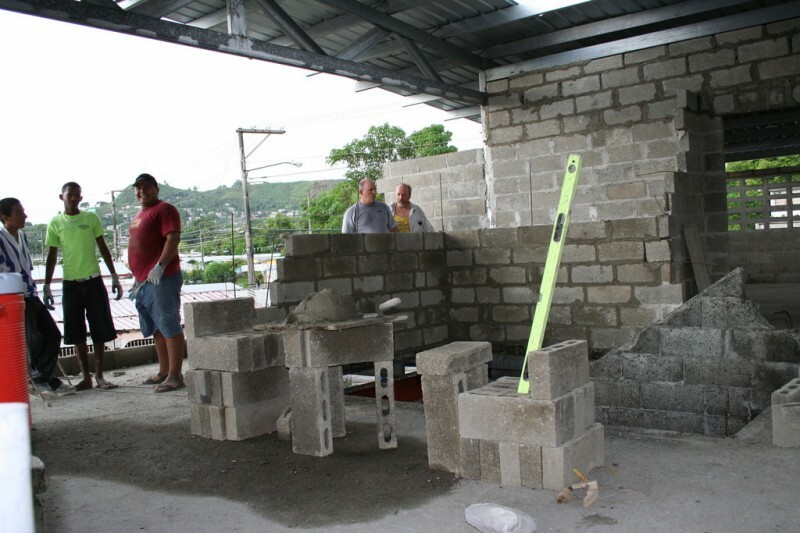 This is a photo of the site from just outside the side door of the sanctuary, in the outdoor hallway going to the kitchen and the school. This is a popular spot to check out the progress and to stand and watch how the rain affects the landscape. 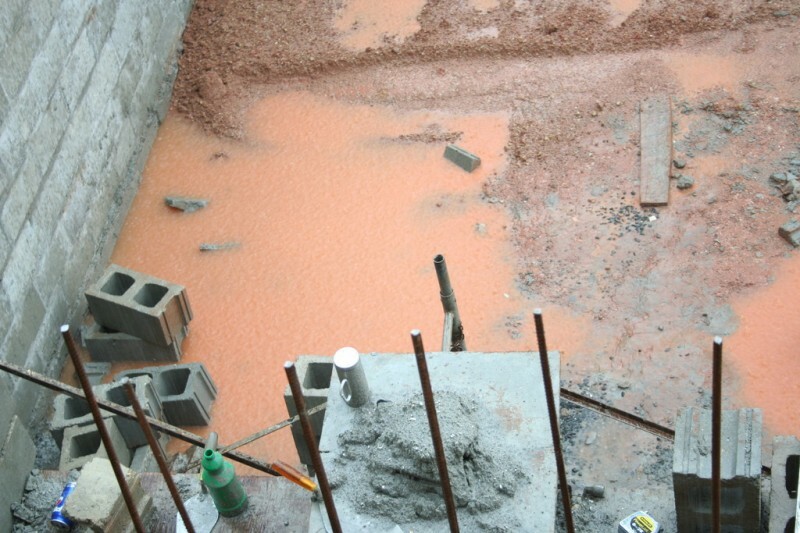 This is a view of the area where they mix the mortar and concrete. The ground was completely dry only a few minutes before. Here's the spot in the hallway I mentioned before where I took some photos from above and where everyone stands to watch. This is Dale Parish, Bob Ward and Debbie Martin waiting out the rain. This is the front entrance to the church sanctuary, where we often sit during breaks. 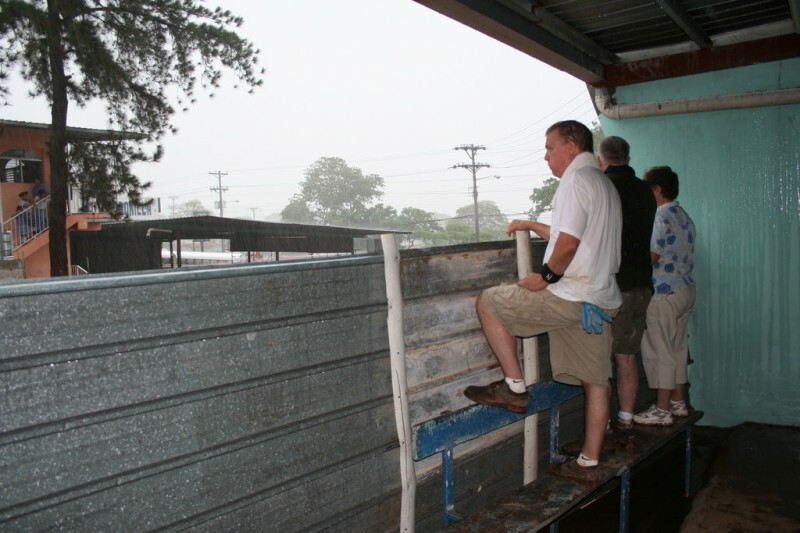 Here is where the majority of the team sat and watched the rain. 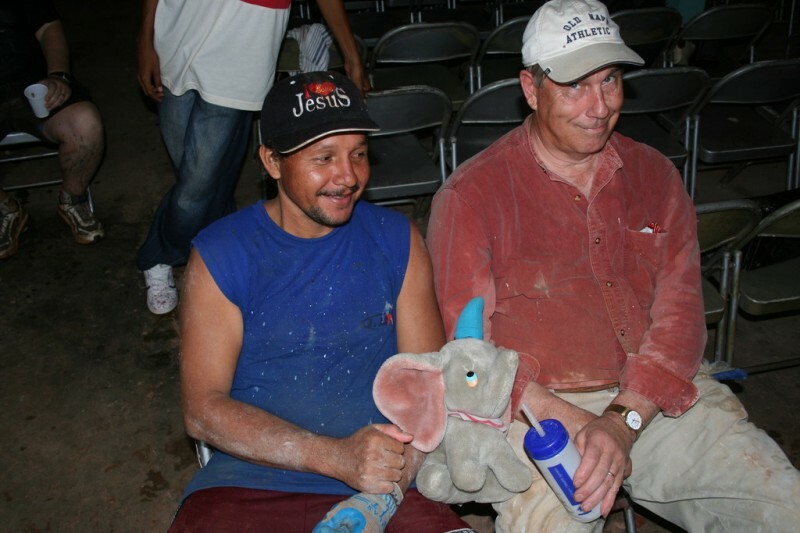 From right to left, this is Carlos (from the Jehova Jireh church), Dumbo (from the Disney movie) and Bob Steele (from our team). I think one of the girls at the school brought Dumbo with her that day and Carlos was bringing him around and introducing him to everyone. 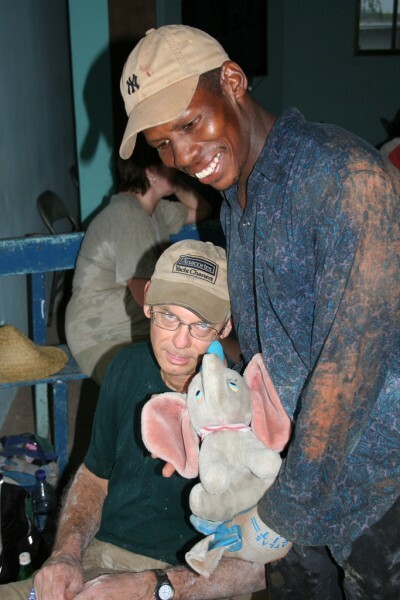 Here is Vic Bailey giving Dumbo a drink while he poses with another one of the Panamanian brothers from the church. 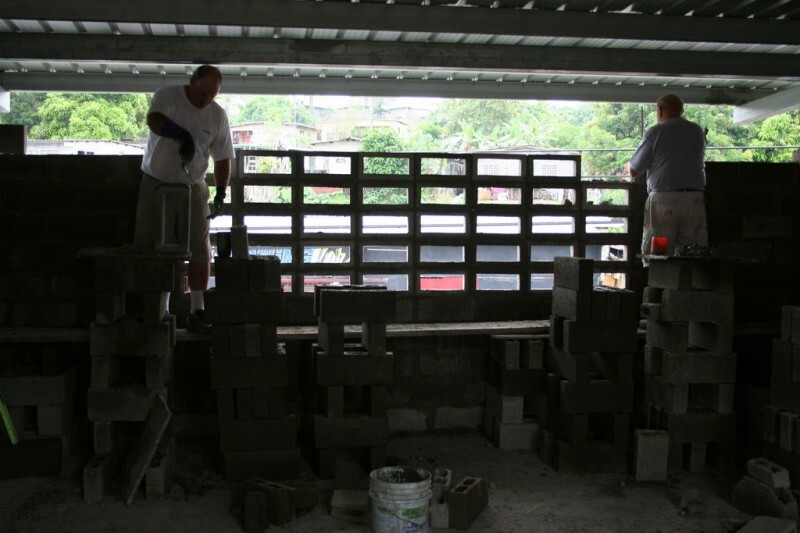 This is the wall Dad and I worked on on Wednesday during the rain. You can see some empty cement sacks on the wall to help prevent the fresh mortar from washing away. This shows the rain drops filling up the puddles. This just kinda shows how incredibly hard it was raining. 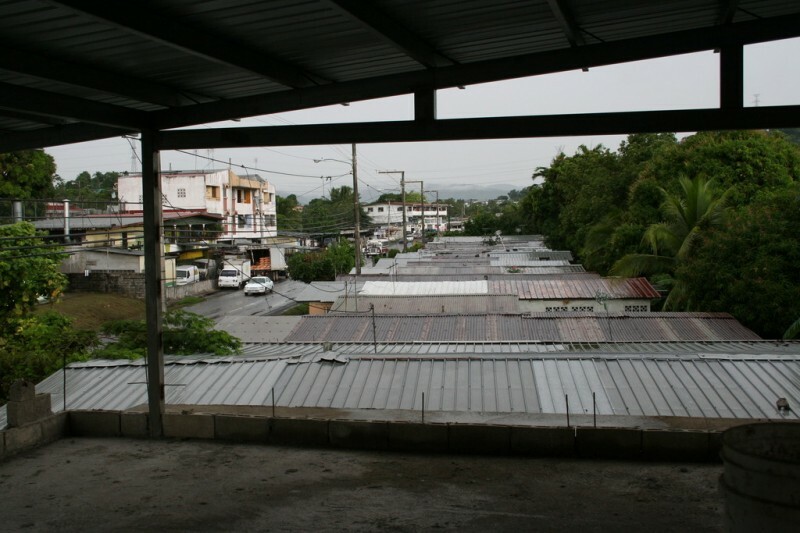 The torrents on the metal roofs made a sound so loud you had to practically yell to be heard. It was a nice sound, though, and a wonderful feeling in the air. The wind was blowing and the humidity was going down. It's nice. The kids at the school were just getting out when we were waiting out the rain. It's neat to see the kids who this project will benefit and spend some time hanging out with them. As a result of this major addition, the number of kids who will be able to attend will almost double. Notice Dumbo made another appearance. This is the wall my dad and I worked on on Wednesday at the end of the day. After the rain stopped we went back to work and laid two or three courses and then set up the scaffolding to go up the next day. 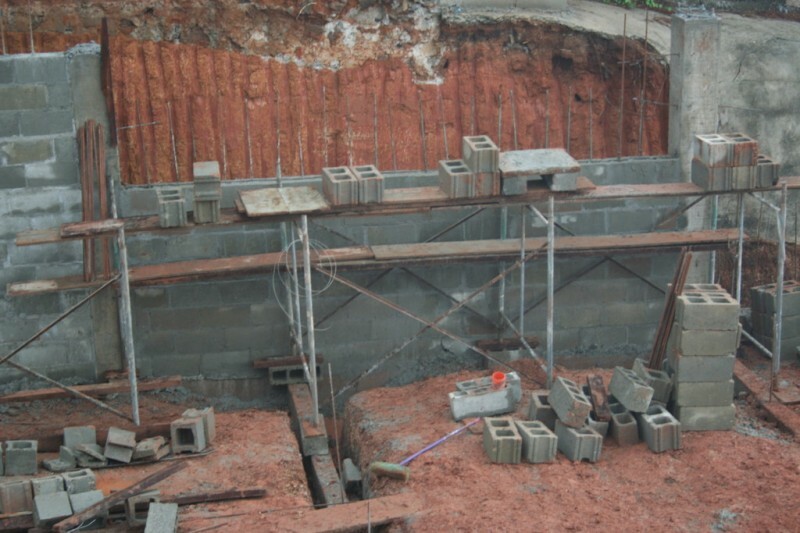 This was a difficult wall because the foundation wasn't level and the re-bar wasn't in the correct places, but I felt pretty good about how it turned out. 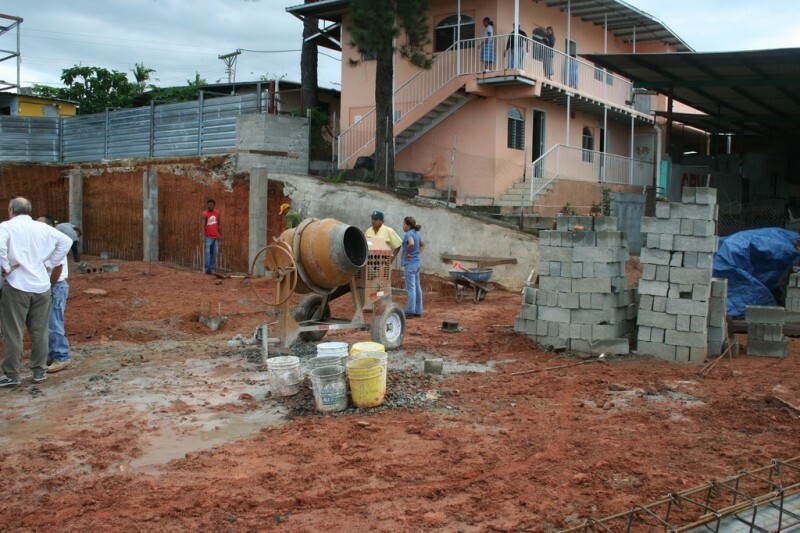 Once the walls get completed they are treated with something like stucco and then dirt is backfilled in behind them. 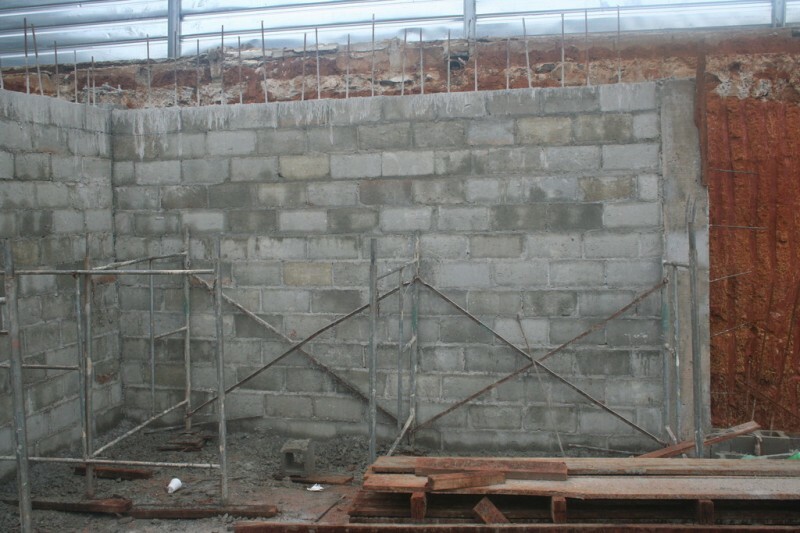 The back of this wall you can see has been treated and the backfilling was started on Wednesday. One or more of the Panamanian guys did the stucco treatment and it's amazing how good it looks even though it's not intended to be perfect since it will get covered. It gives you an idea what the inside of the walls will look like with finish stucco and paint. So, that's it as of the end of day three. this slide, you will see a sloped wall covered with a thin layer of concrete or something like it below the church on the right side. 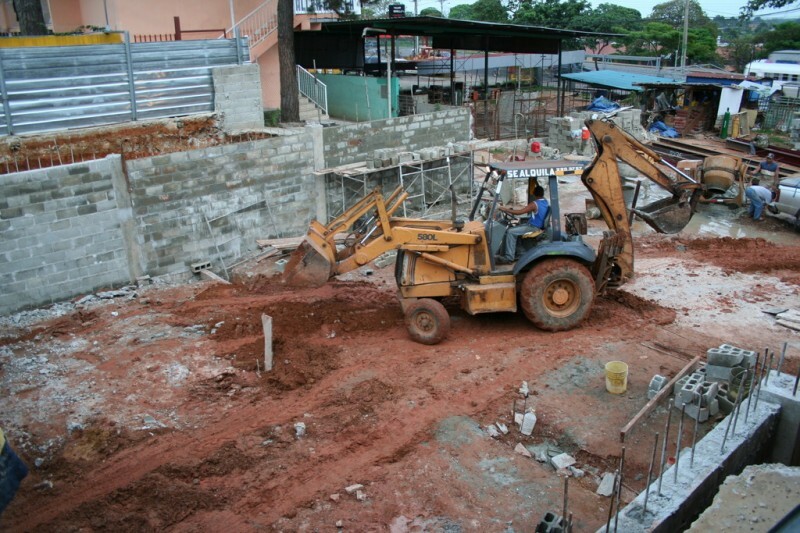 This was demolished as part of the design for the school, and it left a lot of excess dirt to be hauled away. 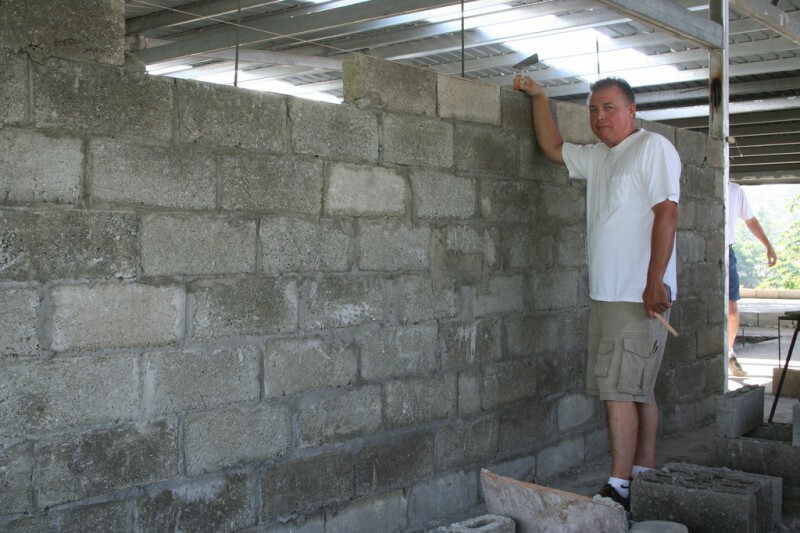 This is the wall my dad and I worked on in the morning on the fourth day. A guy from the church named Angel worked with us the first week, and of all the people we met, I think we spent more time talking with him than any other. He turned 21 on the Saturday in between the first and second weeks we were there. Anyway, he had mentioned that he would like to learn to lay block, and so we let him lay our last block on this wall, and had him write his name on it. 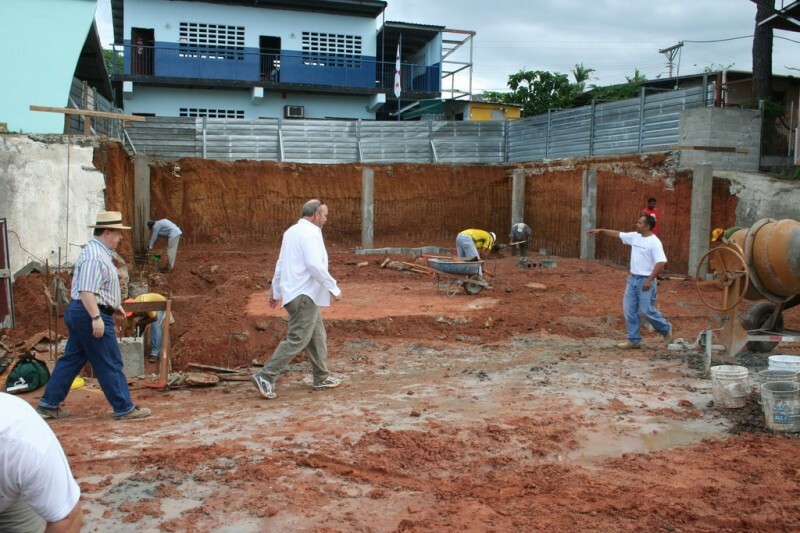 Here is my second cousin Kevin Rueck preparing to set a block while two of the Panamanian men are standing ready to supply him with more blocks or more mortar. 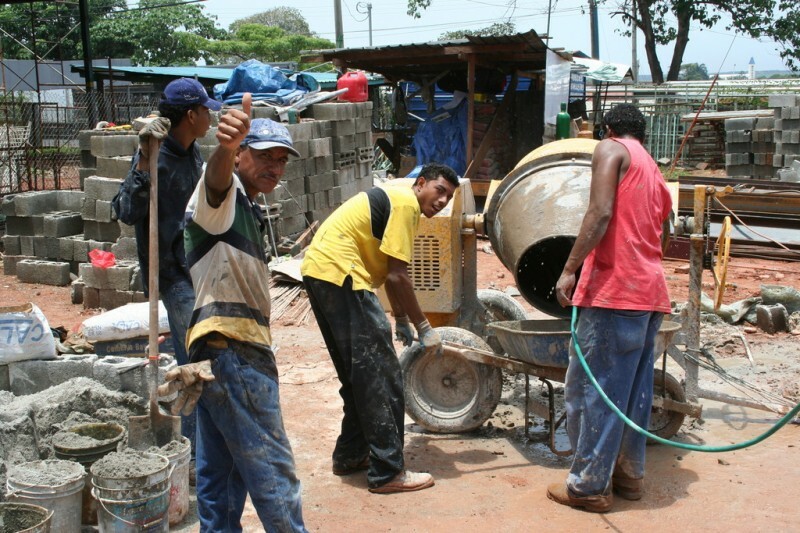 Some of the Panamanian guys worked with Pastor Bob to mix the mortar while we were there, and this is a shot of a few of them cleaning out the mixer. Angel is the one in the yellow shirt. From left to right this is Dale Parish, Dave Martin, my dad and Nate Willhite. 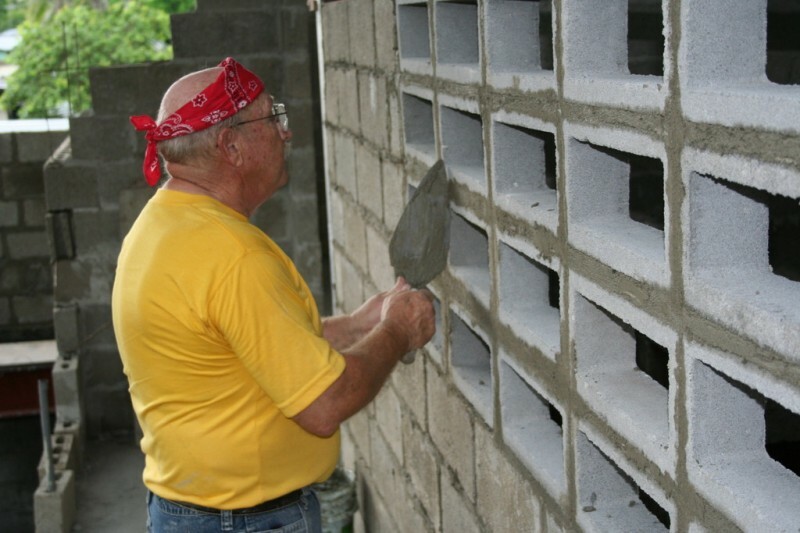 My dad is laying out the wall that he and I will work on during the afternoon on the fourth day, while Dale is cleaning off the foundation so that the mortar will bond well with it. Here is a view of the site at the end of the fourth day. This backhoe was used to do a bunch of things on the site. Right now it is on its way with a load of dirt to backfill behind the far wall. In the foreground in sort of a blur is one of the pastors of the Jehova Jireh church. If we understood right, he is the pastor of those twenty-five and up, probably what we would call the young adults group or something like that. 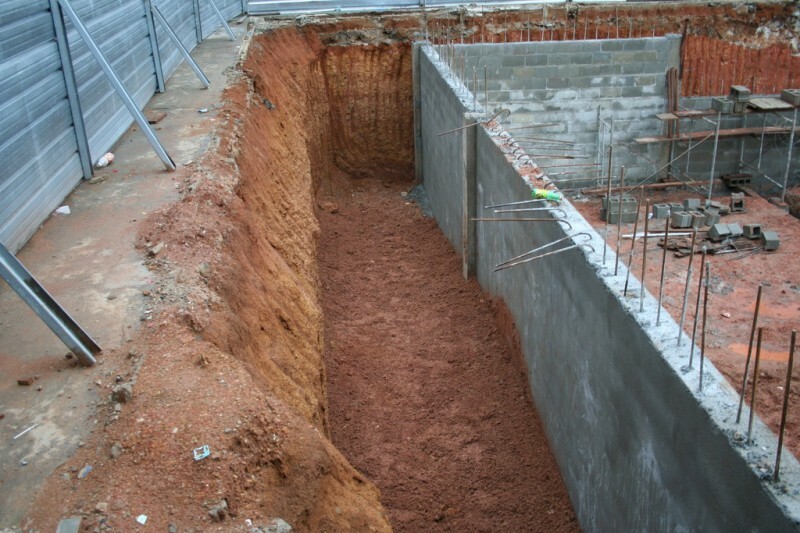 Not only did they have to dump enough dirt behind this wall to fill it up, but it also had to be well compacted so that it would be a solid foundation for the second floor that will be built upon it. 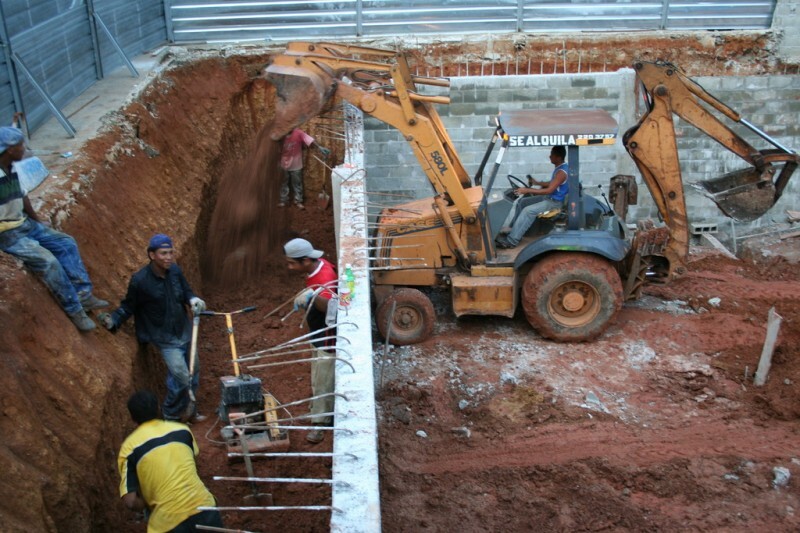 So, these guys got down in the pit and the backhoe lifted the compactor over the wall, and they compacted all the fill that the backhoe moved in there. I was able to catch the backhoe in the action here. 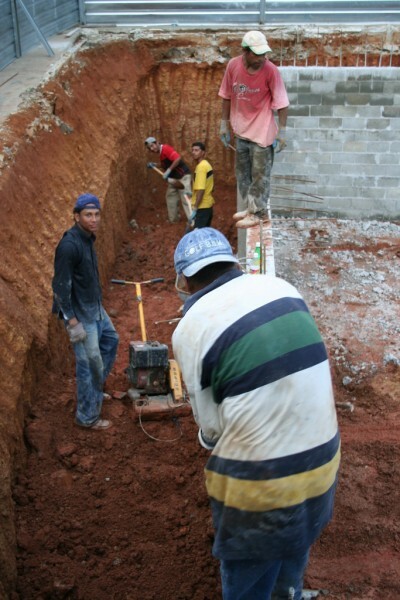 It was a pretty tight fit; if the walls were a little taller it would have been much harder to backfill. 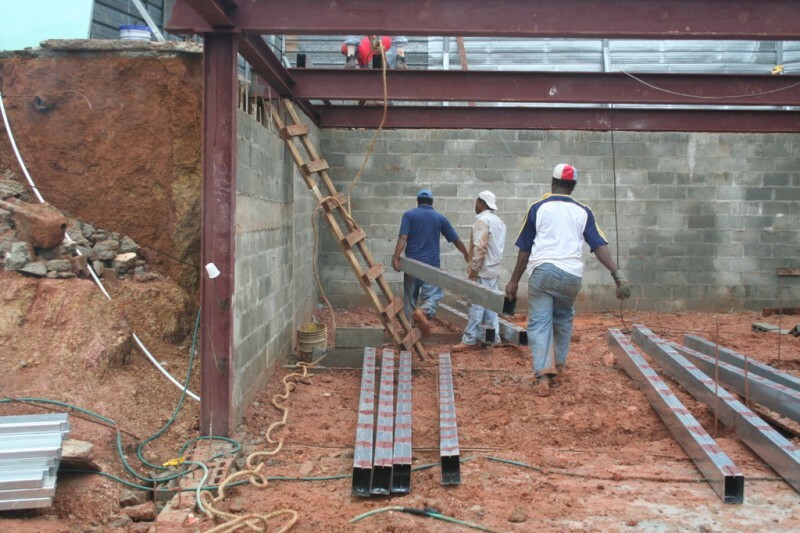 On Friday we moved to another school because they were ready to put in the I-beams that provided the structure for the second story floor, and it wasn't safe for us to be working underneath them as they did that. 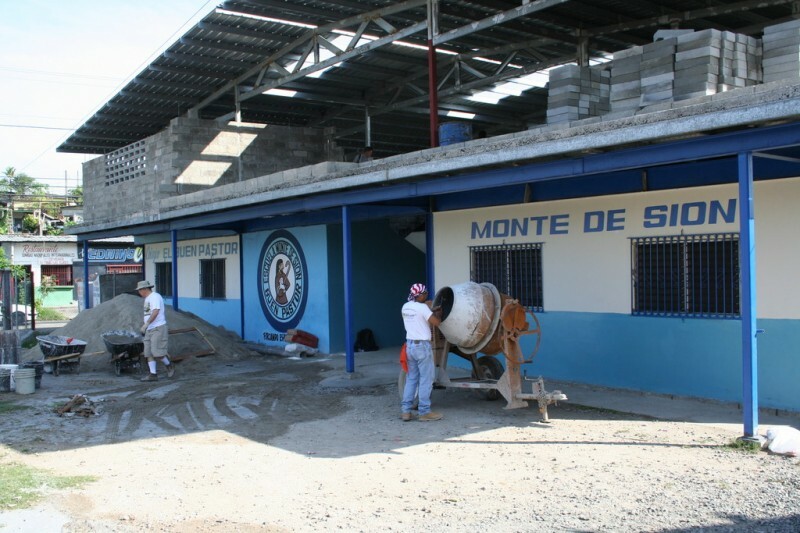 So, we went over to Monte de Sion, a school we worked on in 2003. 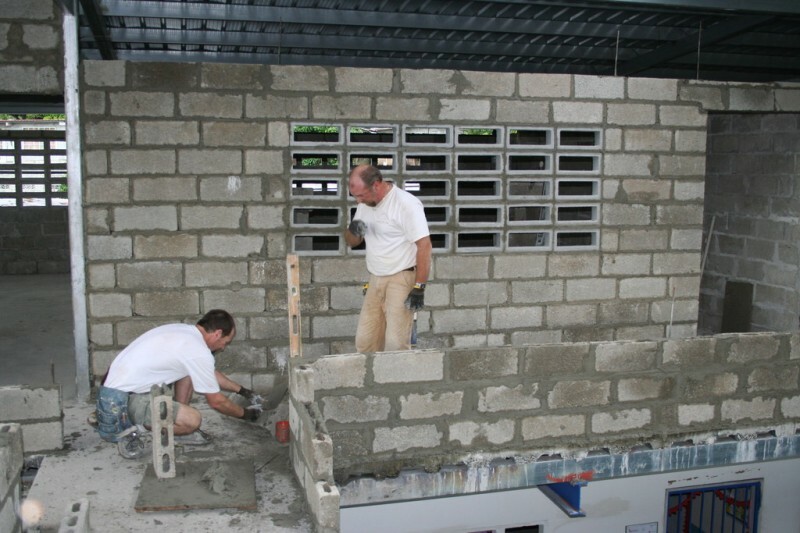 At the end of the project in 2003 we had completed the first floor and the stairs. 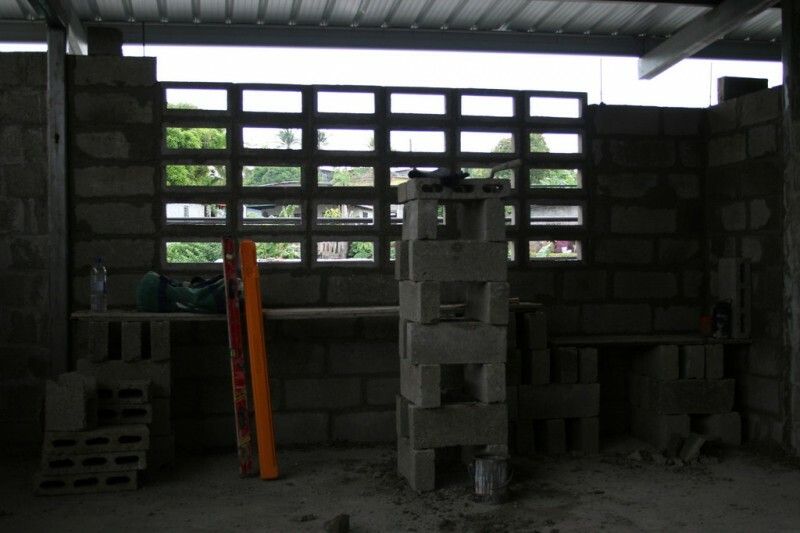 Since we left they have finished the first floor and have been using it, but have been praying for a team to come finish the second floor. We were very happy to be back there and to do what little we could on Friday, Saturday and Tuesday while we waited for work to be completed at Jehova Jireh. 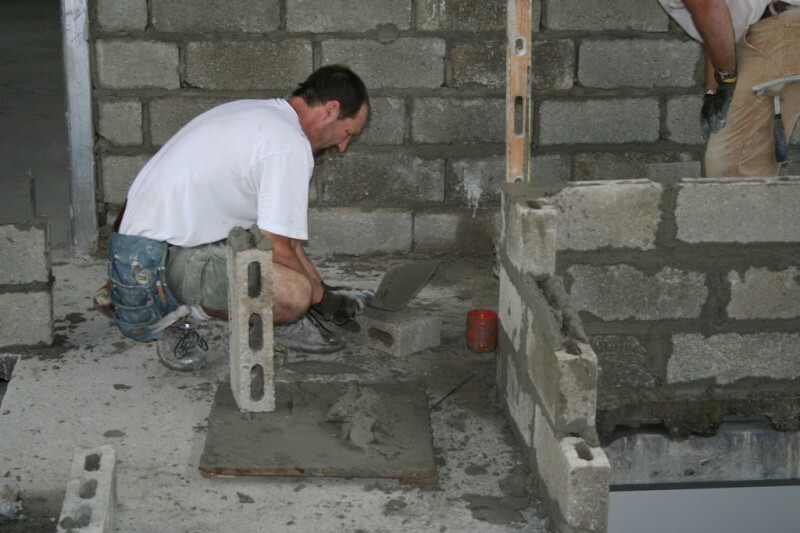 Francisco and Pastor Bob mixed the mortar while we were at Monte de Sion. In this photo we had just arrived and Bob was screeting the sand to get the shells and rocks out while Francisco was preparing the mixer. Notice the really nice custom paint work they did on the school. I was impressed. I think I took this near the end of the day on Friday. This wall was the first wall my dad and I did with Jim Swee, I think. 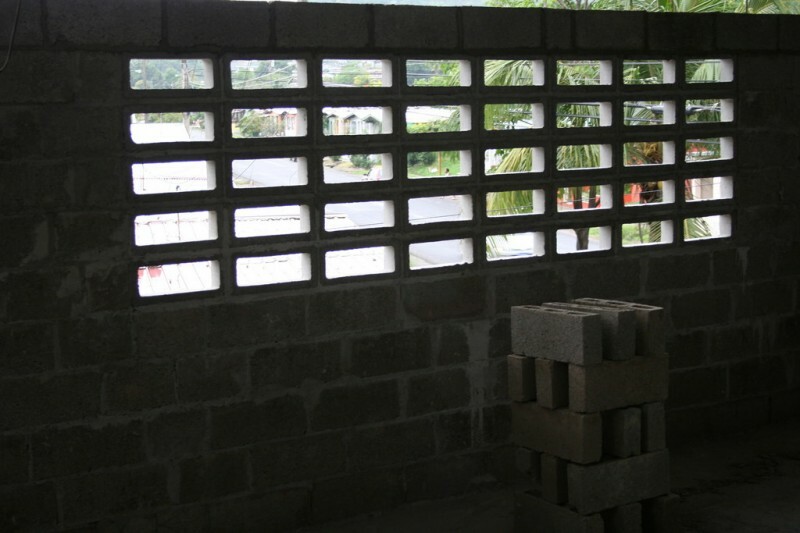 I was working in the middle and so I got to do the window, which is more challenging than standard block because it has to be perfect and the blocks are fairly irregular. I enjoyed taking my time and doing it well. Here is my dad by the inside of the same wall. 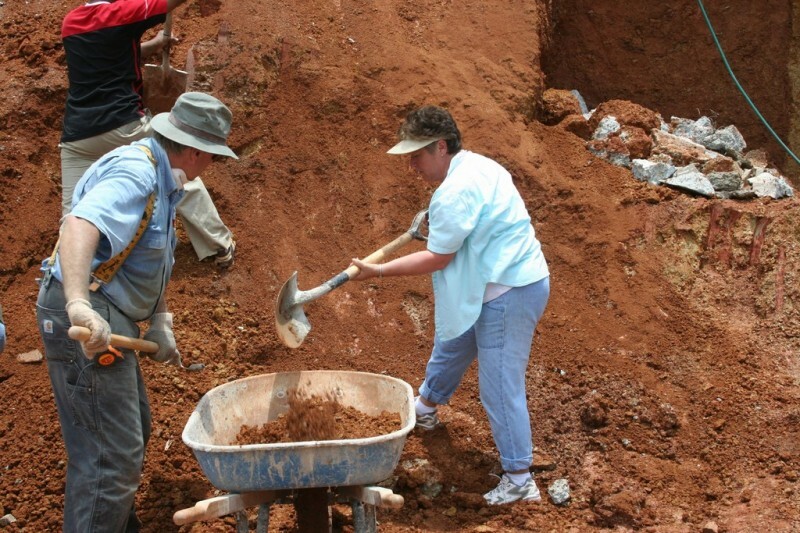 This was the first building trip for Dale and Diana Parish. 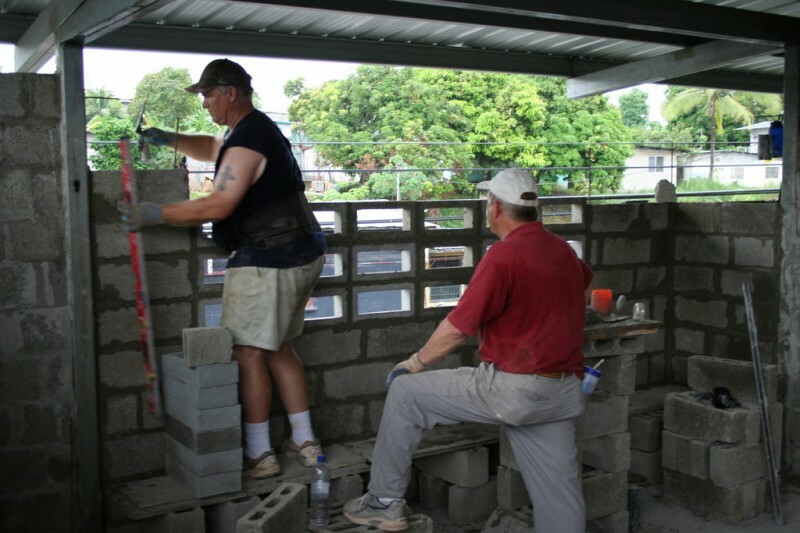 For most of the trip they were hod carriers (people who keep the block layers supplied with block and mortar and whatever else they need), but on this day my dad showed Dale the basics of laying block and he worked on this wall. He learned the basics very quickly. It was great having them on the trip. My dad and Nate Willhite, both veterans of these trips, were working together on this wall while I was working with Jim Swee. 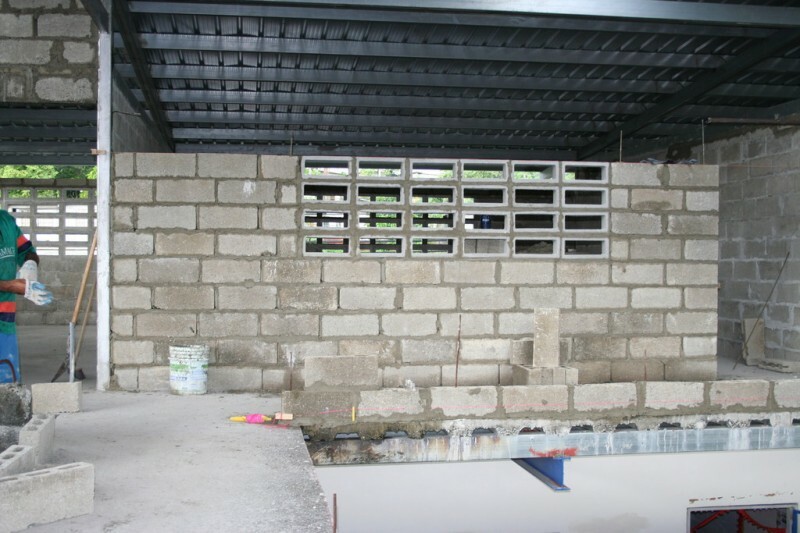 Here is another shot of the first wall my dad and I worked on after the course over the window was completed. This was the last course that we did because on top of that course was a bond beam. Here is Jim Swee starting a course while Vic Bailey is ready to get him whatever he needs. Here is a view looking down the wall facing the main street. You can see a little bit of what the neighborhood looked like. 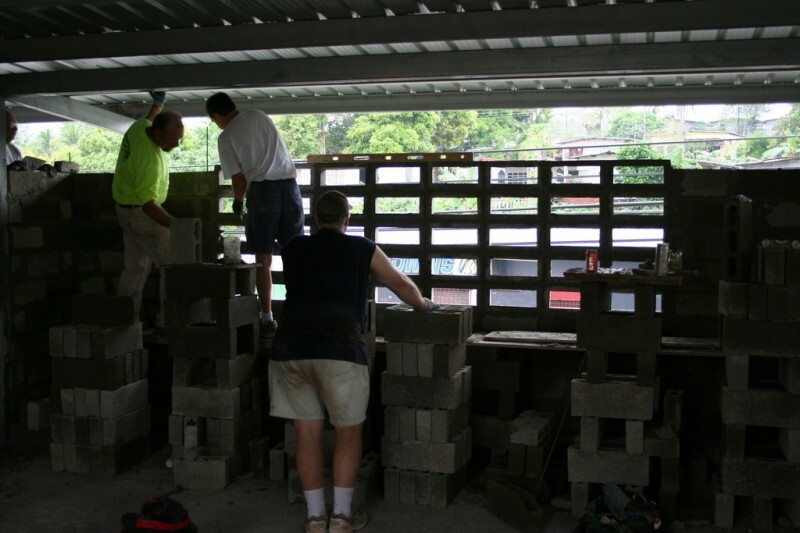 In the back you can see Doug Russell and Kevin Rueck behind him working on the third classroom wall. Here is the view across the street. I love all the beautiful trees that surround all the houses and businesses. My dad and Nate Willhite are back at work finishing up the window on their wall. This is the wall that Jim Swee and I worked on while my dad was working with Nate. He is very fast and good, and so he did the whole window while I worked on the corner to the right of it. From left to right Doug Russell and Kevin Rueck finishing up their window while Jim comes over to check it out before going on break. Looking through the school under construction down the street. 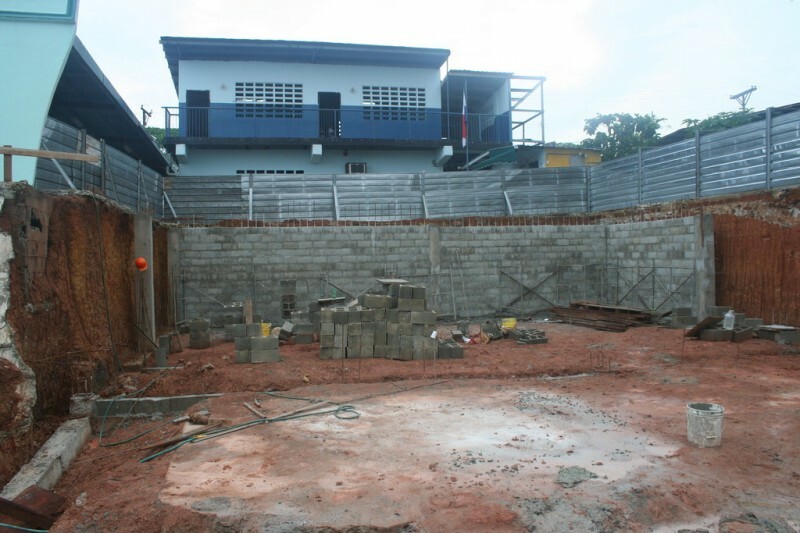 Here you can see a little bit of the layout of the school. There are two rows of classrooms on each side with this large hole in the center overlooking the courtyard below to let air and light in. 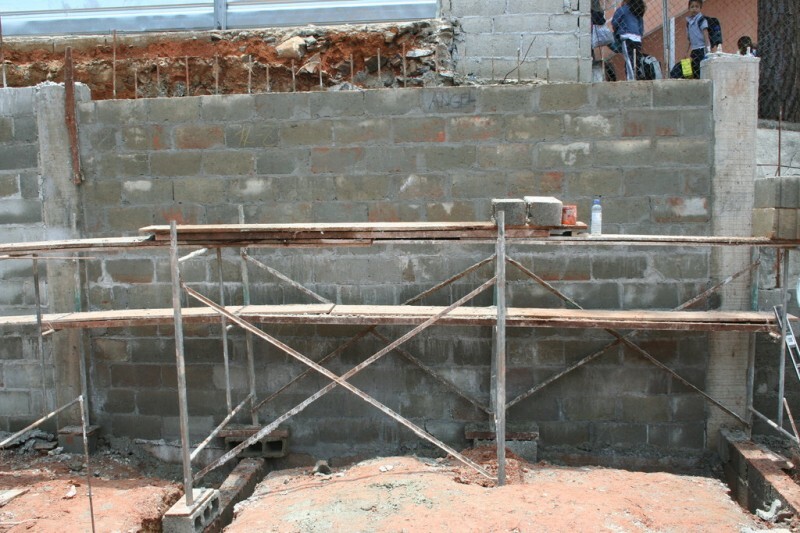 Later on we would begin the railing walls to make this hole safe for the kids. This is the view looking out the other side of the school. To the right and below where this photo is showing is the church that started the school. Again you can see how green it is. I really like the trees in Panama. There aren't many coniferous tress, mostly deciduous, although I'm not sure when they loose their leaves. They have always looked green when I've been there. So, we worked at Monte de Sion through Saturday, and on Sunday and Monday we took time off to relax and do some sightseeing. 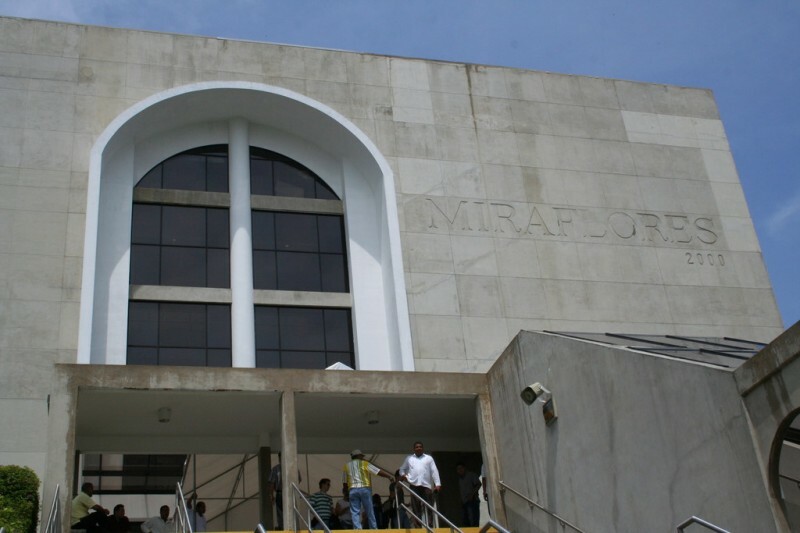 This building is the Miraflores Locks Visitor's Center at the Panama Canal. 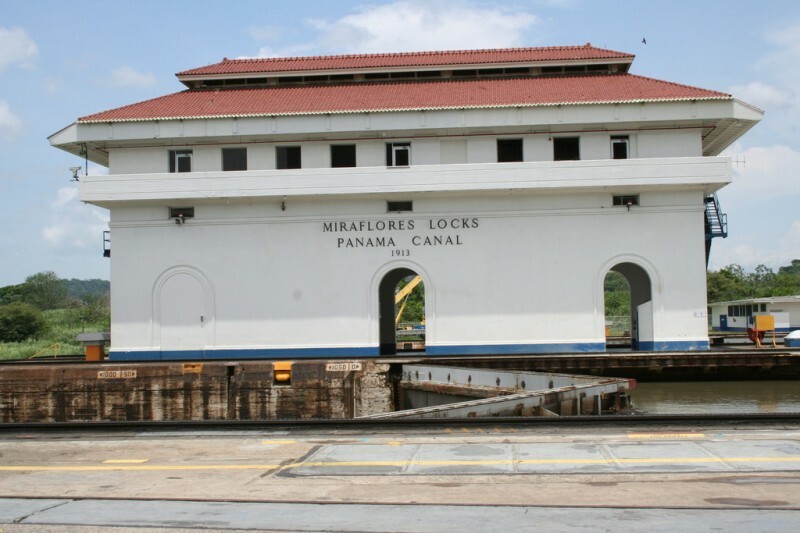 If I remember right, it was built shortly after Panama took over control of the Canal from the US at the end of 1999. 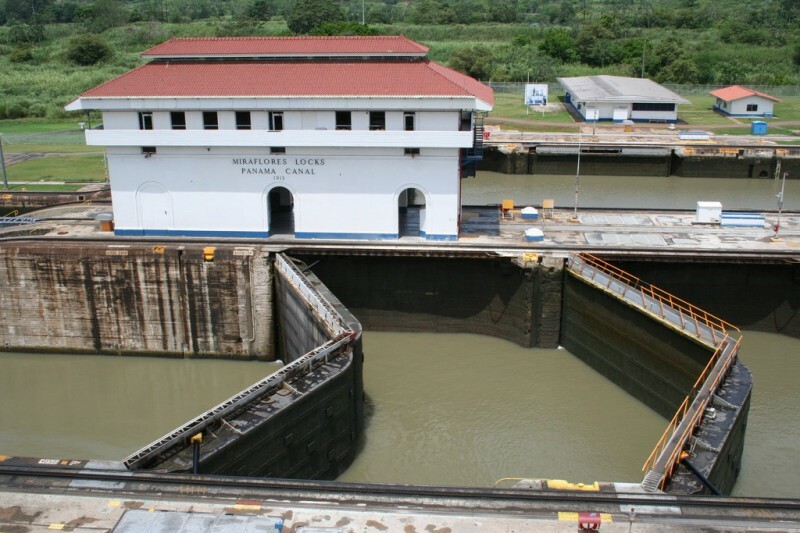 It has an amazing museum showing the history and current operation of the canal as well as a great spot to view the ships going through the locks. This is one of the three sets of locks on this side of the canal as seen from one of the viewing levels at the visitor center. It's crazy to think that these huge doors that were built before the canal opened in 1914 still work and are used every day. Here is a ship going through the locks. If you look on either side of the ship you can see railroad tracks and little cars that have cables attached from them to the ship. These cars are what keep the ship going straight so it doesn't collide with the sides of the channel. As you can see, there's not much room for error on a ship this large. 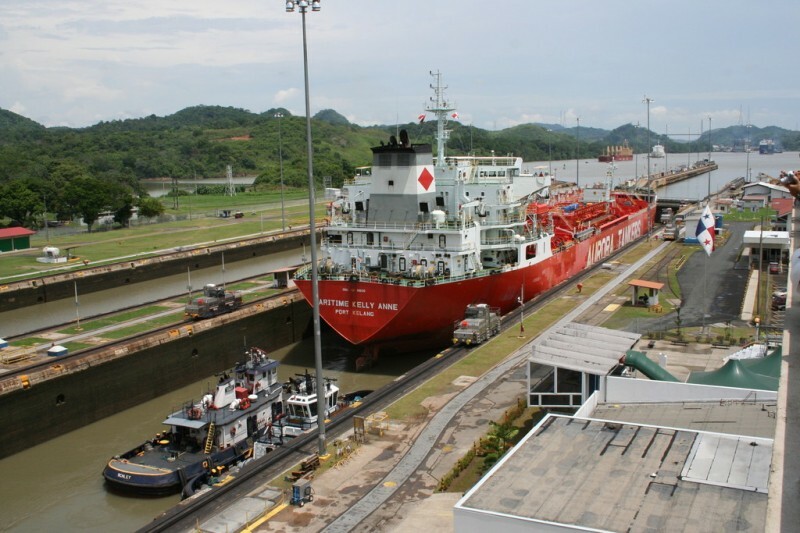 As I mentioned before, Panama took over the control of the Canal from the US I believe at midnight on December 31st, 1999. Before that time Panamanian people weren't allowed to even enter the Canal Zone, as it was strictly controlled by the US Military. 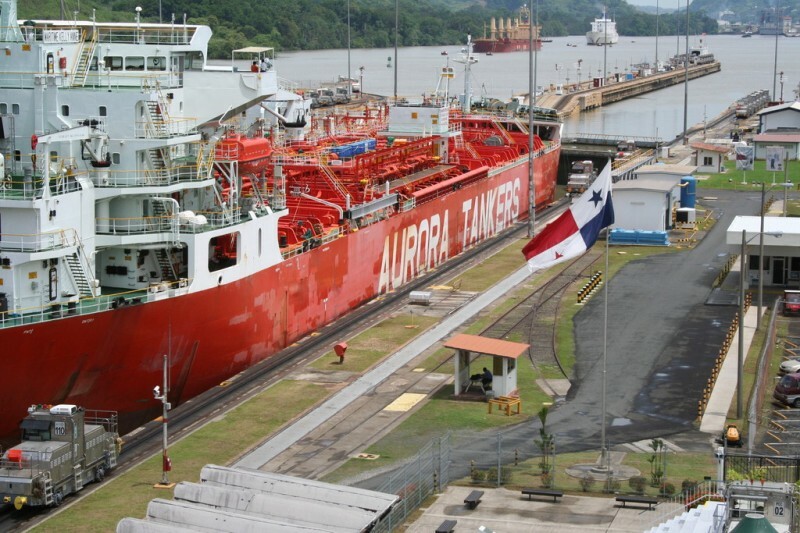 The Panamanian flag now flies proudly over the locks as it watches the ships go by. This building has become for me the symbol of the canal, as it is the main thing you see beside the locks themselves from the viewpoint at the visitor center. I took this photo inside the museum, which is quite impressive. 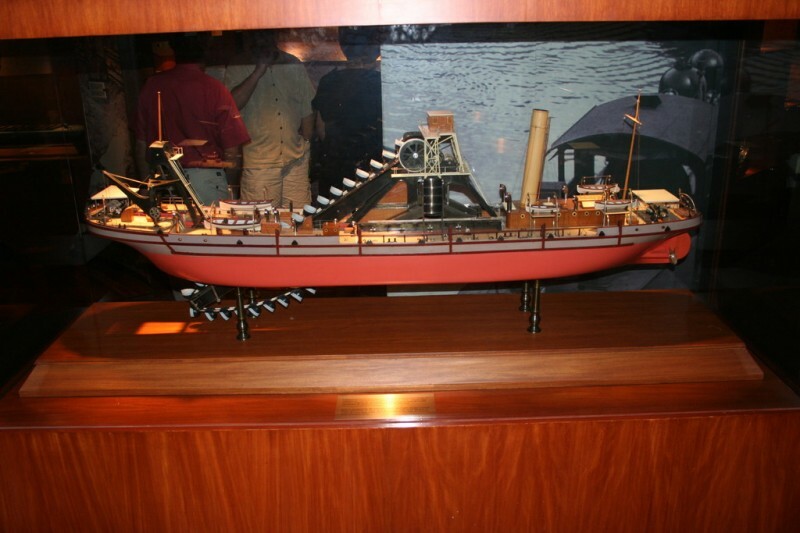 This is a model of one of the dredging ships that was used to deepen the canal. The buckets you can see scoop up the dirt from the lake and deposit it in the ship to be taken elsewhere and dumped. As I said before, the museum was really neat. 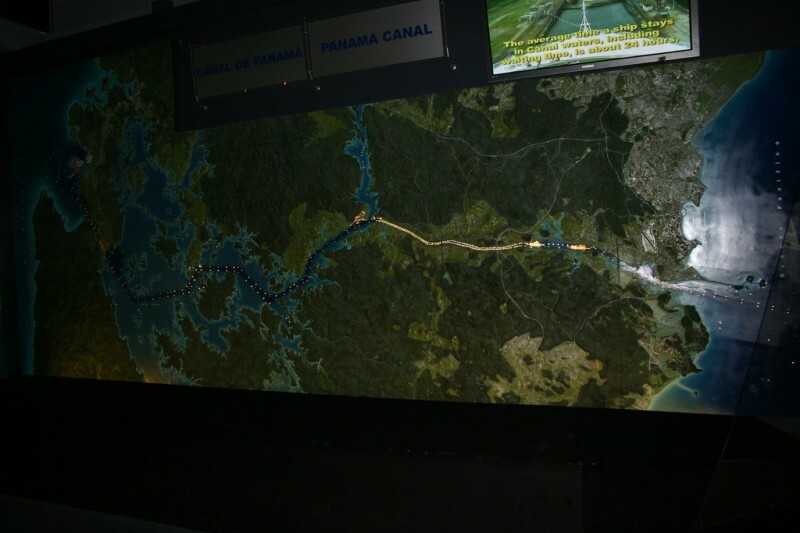 Again inside the museum, this is a lighted map of the whole canal, which is made up of two sets of three locks on each side, connected by natural and man-made lakes and various man-made channels. 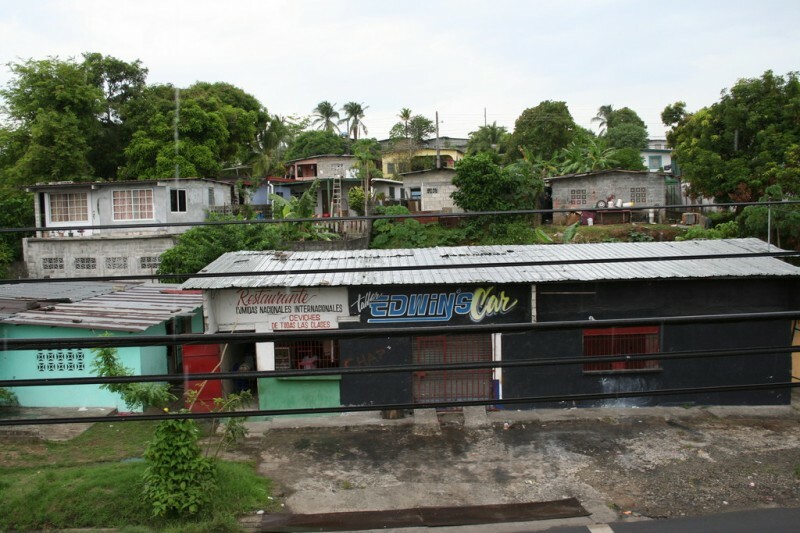 We stopped by the canal on the way to an extremely nice beach resort called the Royal Decameron that we stayed at on Sunday night and Monday morning. 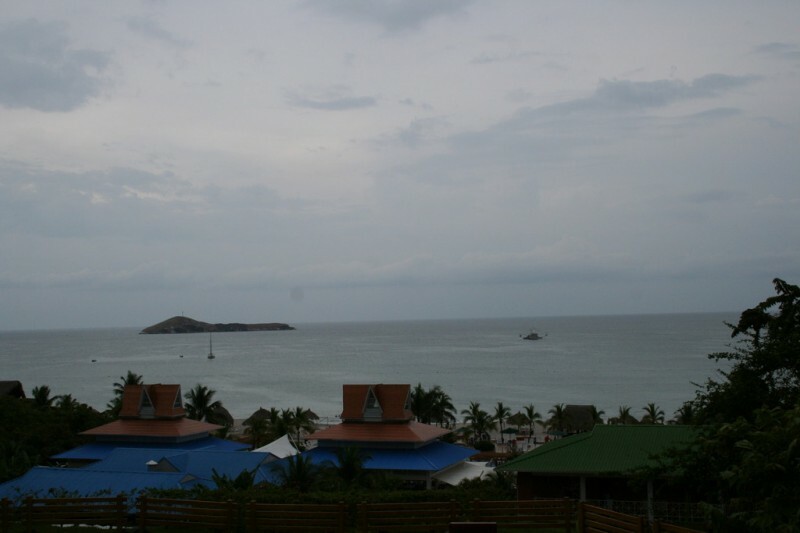 This is the only photo I have from there, and it's the view from our room. It was an all-inclusive resort, which means that we got a wrist band that got us free food and drinks from any of the many restaurants and bars throughout the huge resort. I was sort of depressed the first night we were there seeing the extravagance of it all in contrast to the point of what we were doing in Panama, but I really enjoyed a nice long swim in the warm Pacific Ocean on Monday morning, followed by a very relaxing lunch before we headed back in the van to return to our hotel in Tocumen. 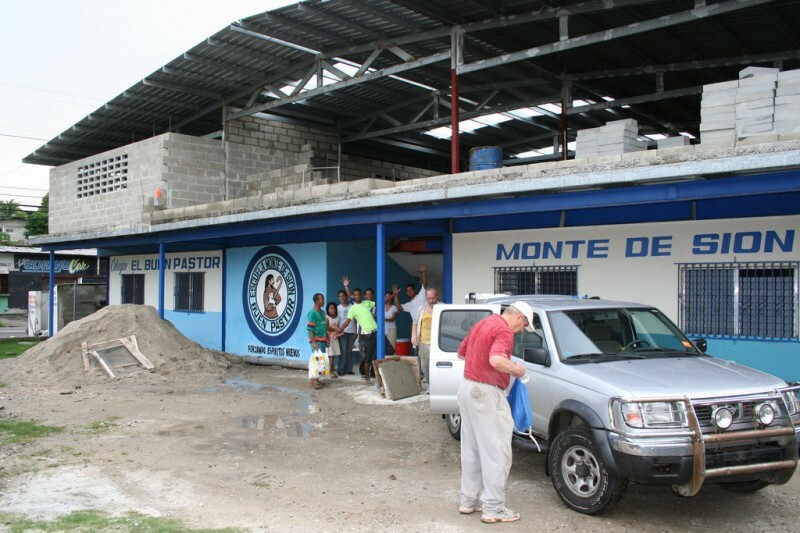 On Tuesday we returned to Monte de Sion because they were still not done working overhead at Jehova Jireh. The drive there was very long as it is far away from our hotel and in horrible traffic, but we really were glad to be able to go back. 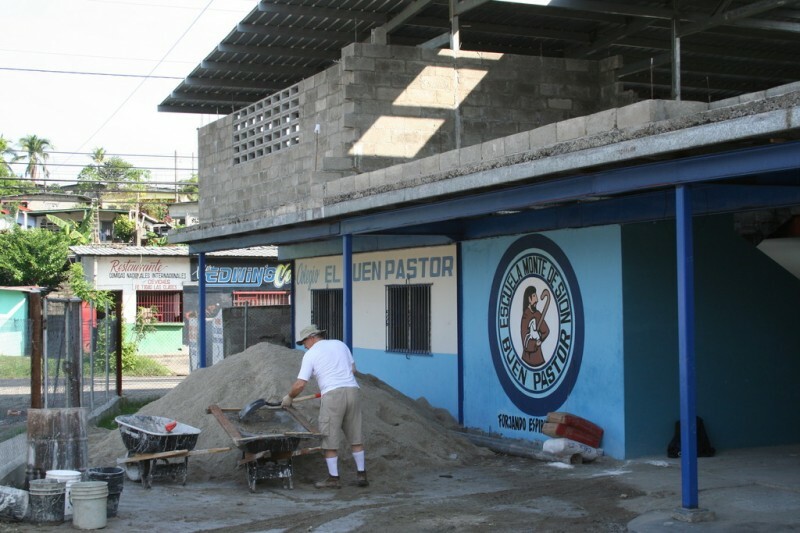 The people at the church and school were wonderful and we wanted to get as much done as possible for them. This is a shot of the wall that Nate and I did on Tuesday. 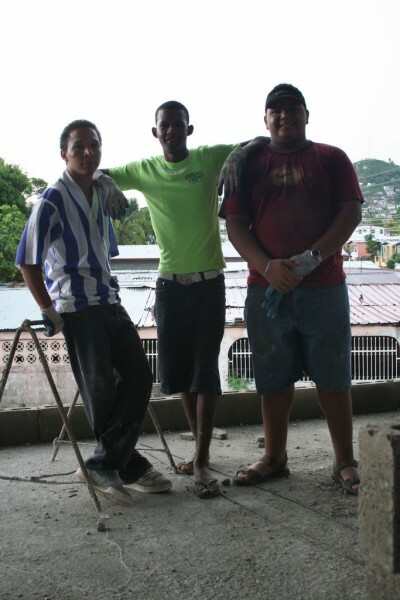 These were three of the Panamanian young guys from the church who worked with us, along with my dad and Dave Martin, working on the walls around the stairwell. 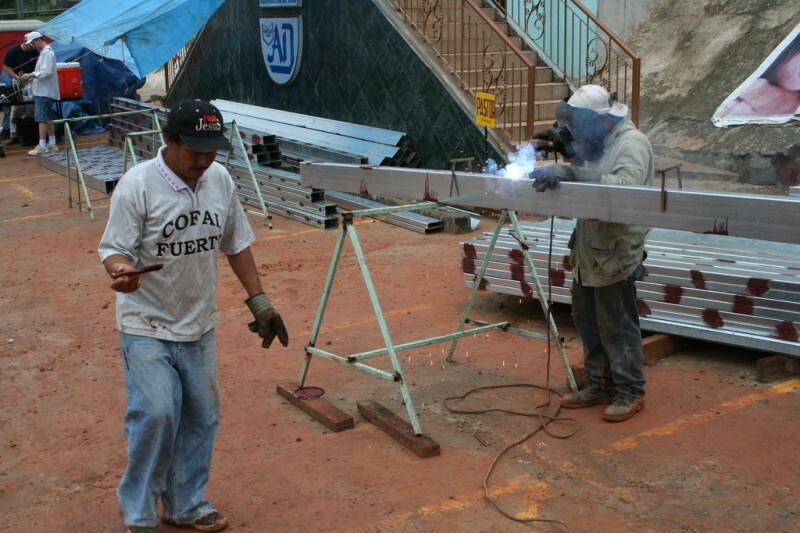 Here's a better photo of the same three guys who worked with us at Monte de Sion. Sadly, the only guy whose name I remember right now is Arsenio who is on the right. The guy in the middle was out helping out when we were there in 2003, and remembered us. I think he had changed a lot since then. I think he is around seventeen now, but I can't remember for sure. Another view out the back of the school. 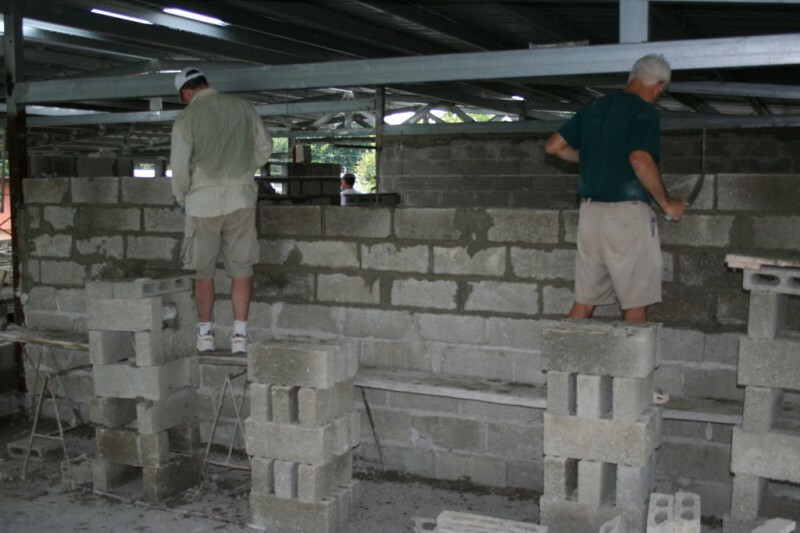 From left to right, this is Lee Street and Bob Steele working on their wall. This was Lee's first trip, and he was a hard worker, hod carrying for most of the trip, but laying block this day with Bob. Bob actually came down a week or two early on an REI Adventures trip. He showed me his photos one night. 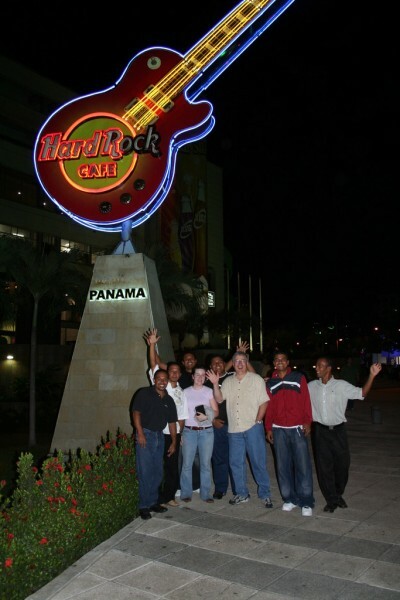 It sounded like a really cool time of hiking and white water rafting and just seeing some of the different parts of Panama that you wouldn't normally see on a trip in the city. Nate Willhite is cleaning up the excess mortar on the window that he and I worked on together. 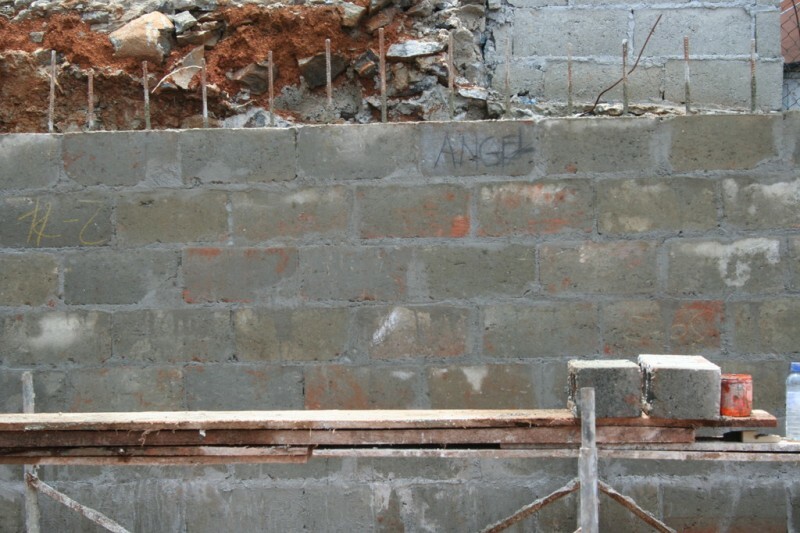 Here Kevin Rueck is working on the wall that surrounds the hole in the center of the building. This was one of the last things we got done before we went back to Jehova Jireh on Wednesday. Kevin and Doug Russell worked on this railing wall together. It's hard work laying those first few courses because you're always bent over, and this was a very long continuous wall. Behind them is the completed wall that Nate and I did. Sunflower seeds were a common snack on the trip, and some people were commenting on how spitting them wasn't very lady-like, but that didn't bother Stephanie Ward. She was a hard worker. 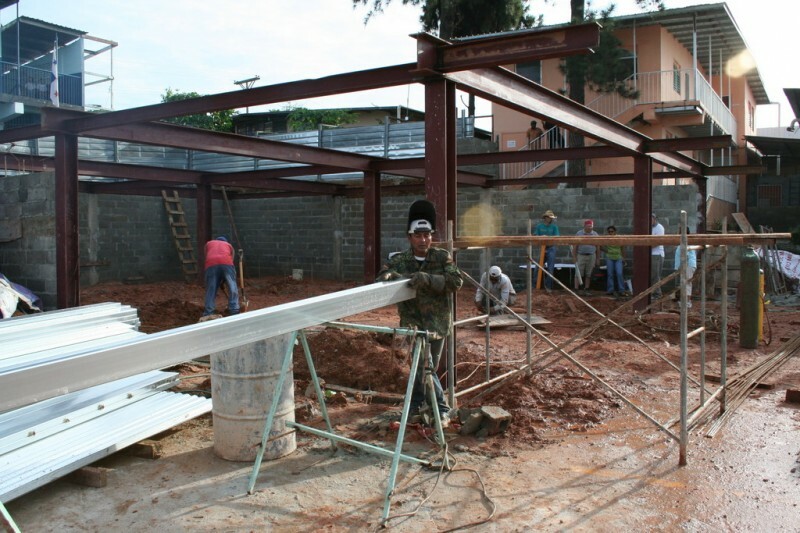 At the end of the day on Tuesday we had finished a little more than three classrooms and had gotten the railing started. I'm not completely sure because I was working on other walls at the time, but I think it was mostly my dad who worked on the walls around the stairwell. 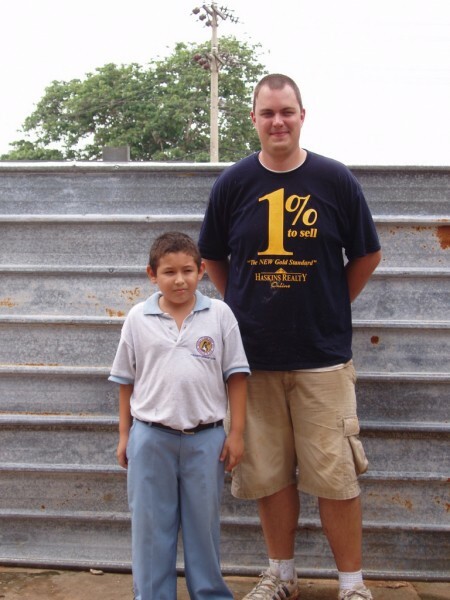 That was another important railing that needs to be completed before the kids can use it. 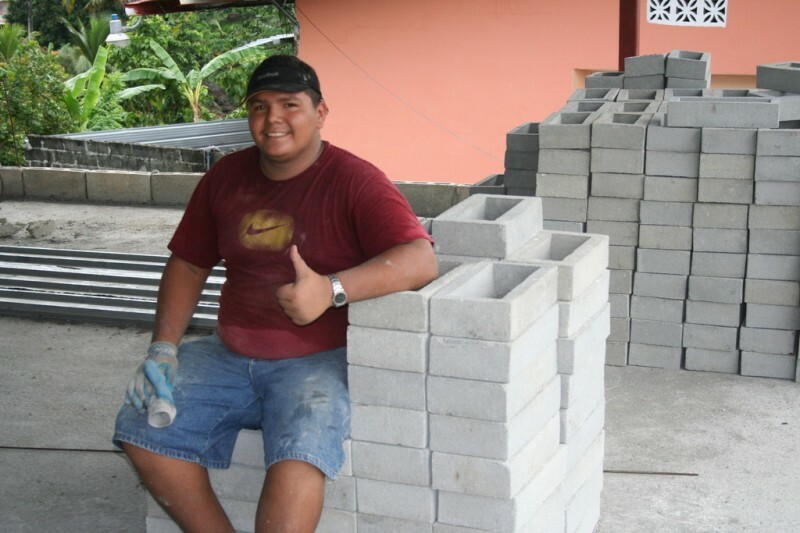 Here's another shot of Arsenio taking a break by the stacks of window blocks. It was sort of sad when we packed up all our tools and left Monte de Sion for the last time this year. 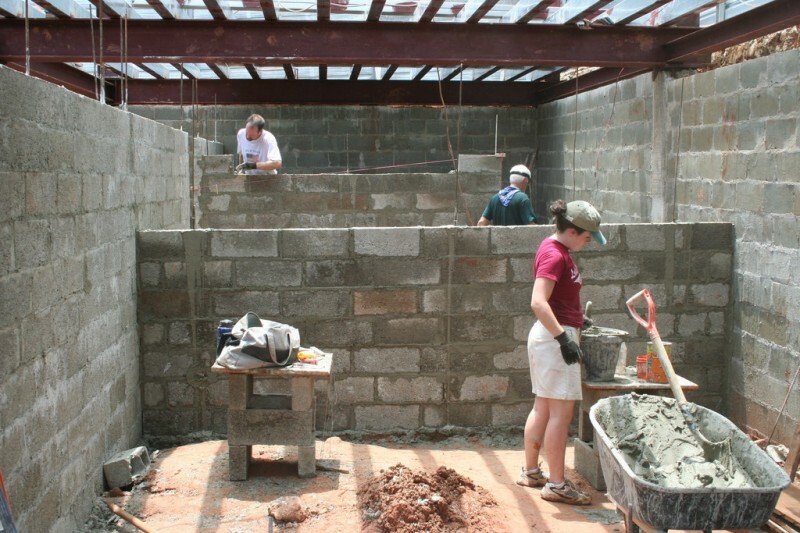 We were glad to have gotten those three classrooms done, but we would have liked to finish the whole second floor. Hopefully another team will come and help them finish, or we will be blessed to go back and help ourselves. The people there are great. 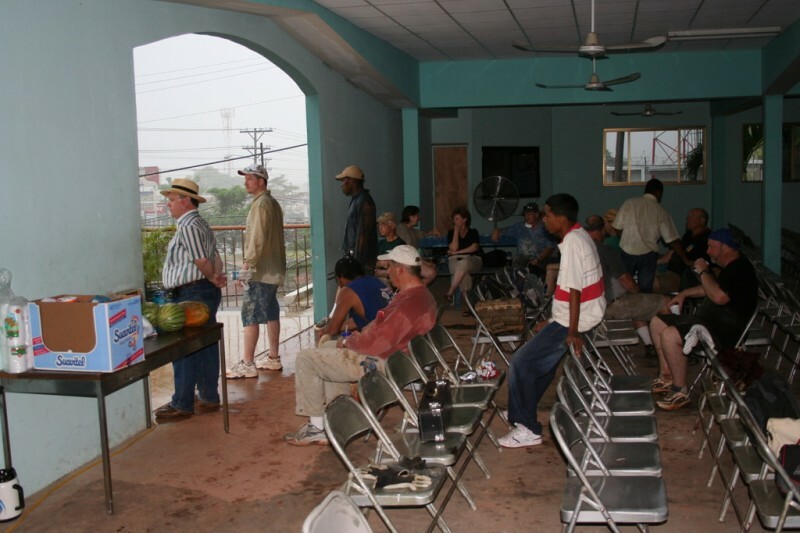 This is the view of the site when we got back to Jehova Jireh on Wednesday morning. As you can see they got all the I-beams up and there is a stack of purlins on the left there that are welded and ready to be painted and installed. I really like this photo of one of the highly traveled areas of the work site. This is what it typically looked like in the mornings when we arrived. 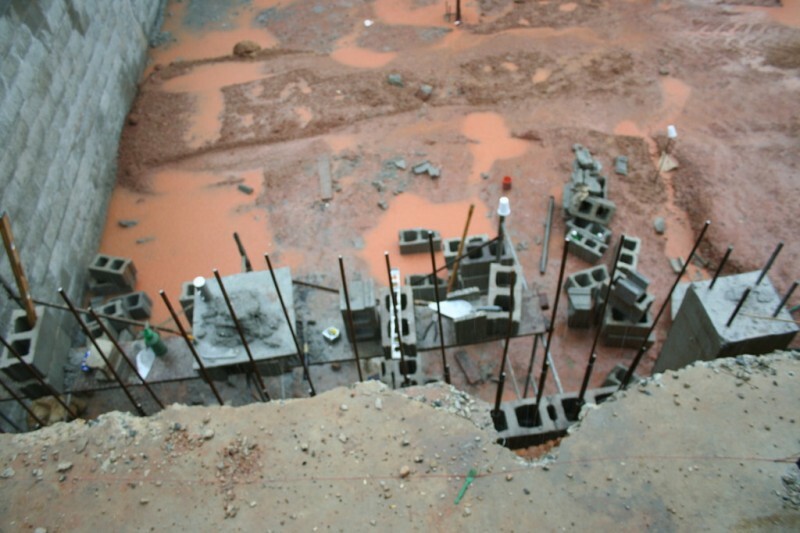 The rains from the afternoon before still muddied the red clay that stuck to our shoes as we walked through it. 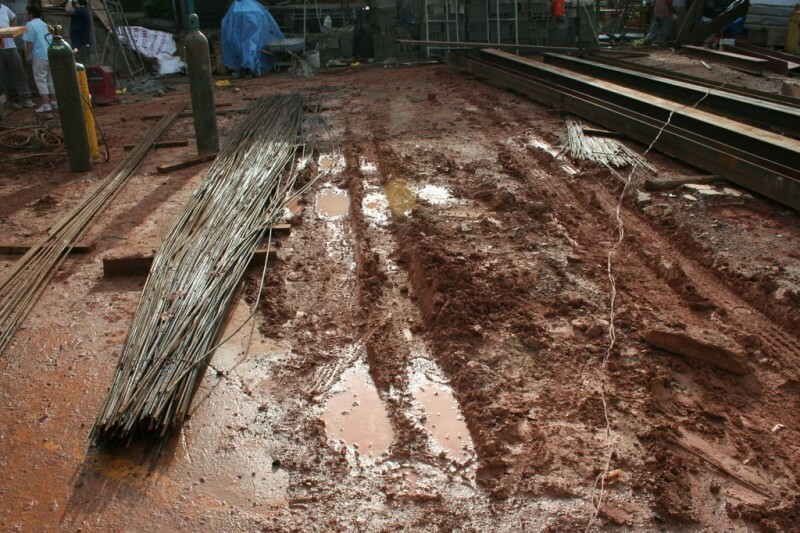 On the left is the pile of rebar and to the right more steel I-beams. Here we are checking out the site and deciding where to start for the day. 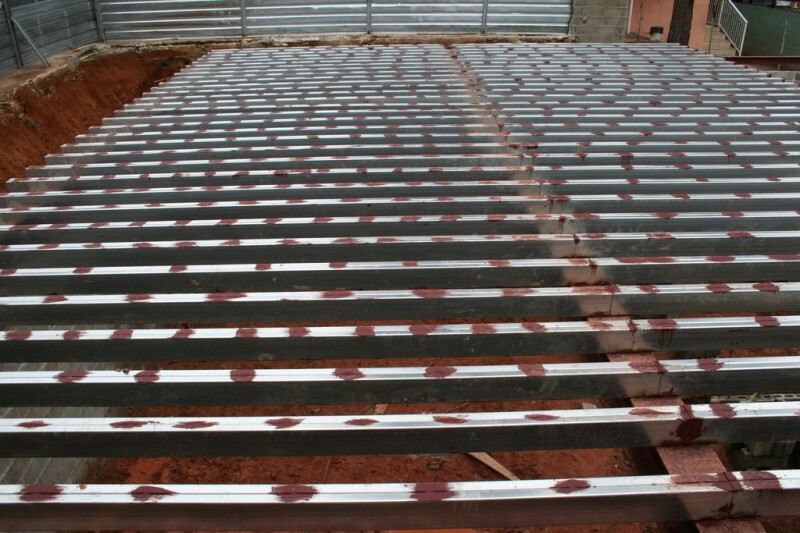 In order to make these purlins, two metal pieces were welded together and then the welded spots were painted to prevent them from rusting. This is a view from that spot where we always stood on the bench to survey the site. It looked kinda cool with half to two-thirds of the purlins in place. 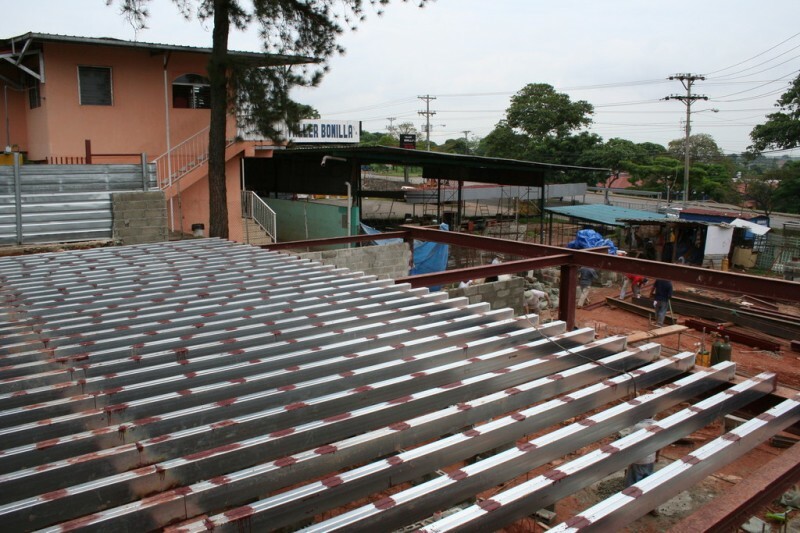 There was just one more section to go and the purlins for the second story floor would be installed and ready for the corrugated metal that goes on top of them. Quite a bit of backfilling had gotten done while we were away. 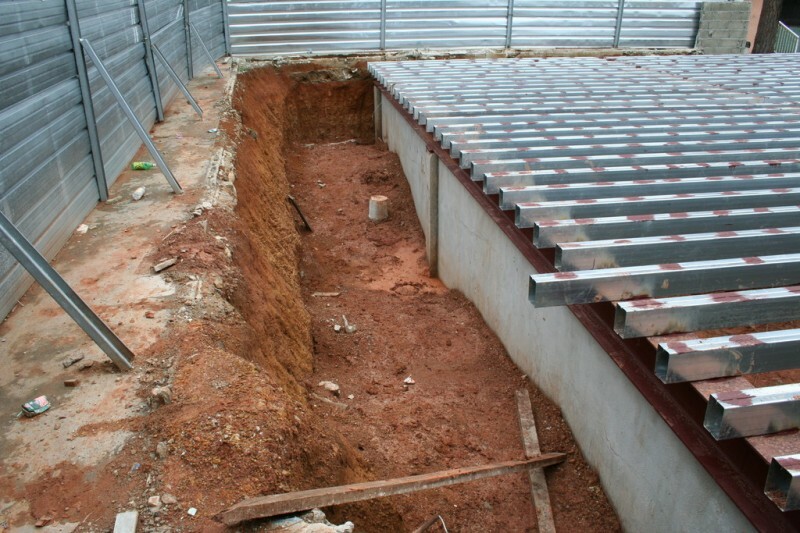 It took a lot of dirt and a lot of work to compact it in order to fill that huge void. 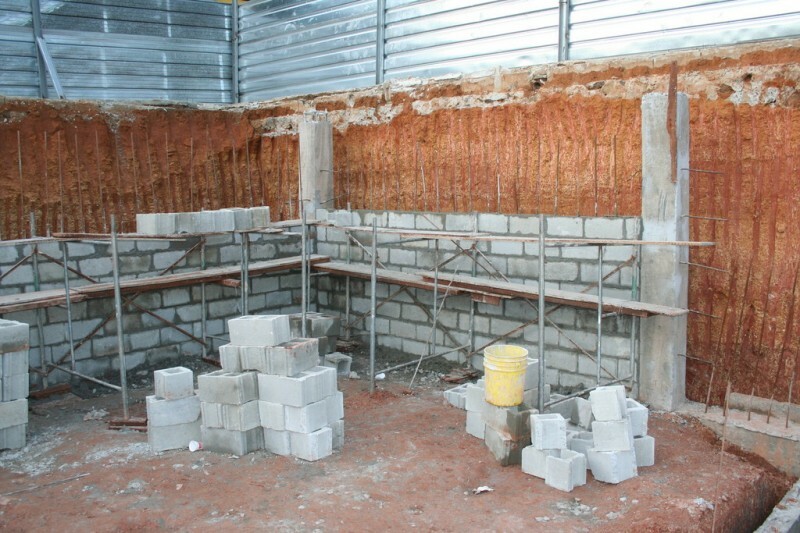 This is what the interior walls looked like at the end of the day on Thursday. The bottom floor of this addition (what we were working on) was mostly offices and a library, I believe. Most of the offices are small rooms so there were a lot of walls, as you can see. 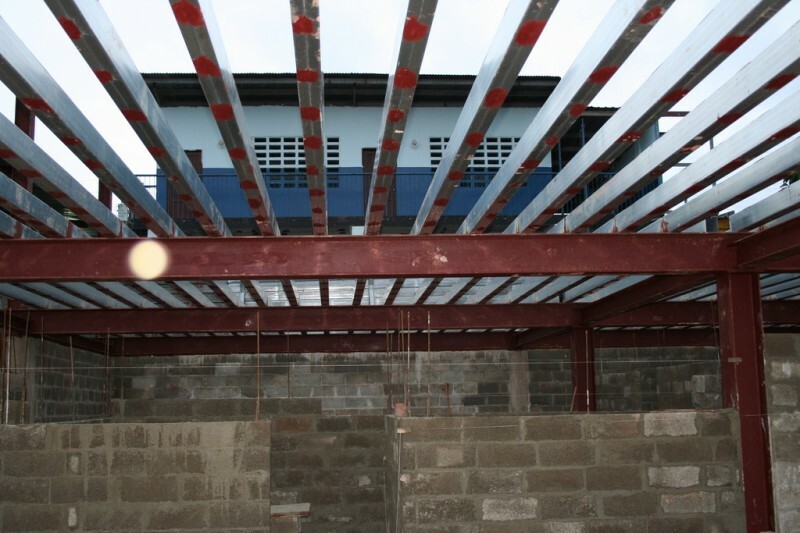 This is a shot looking up through the purlins at the existing school. 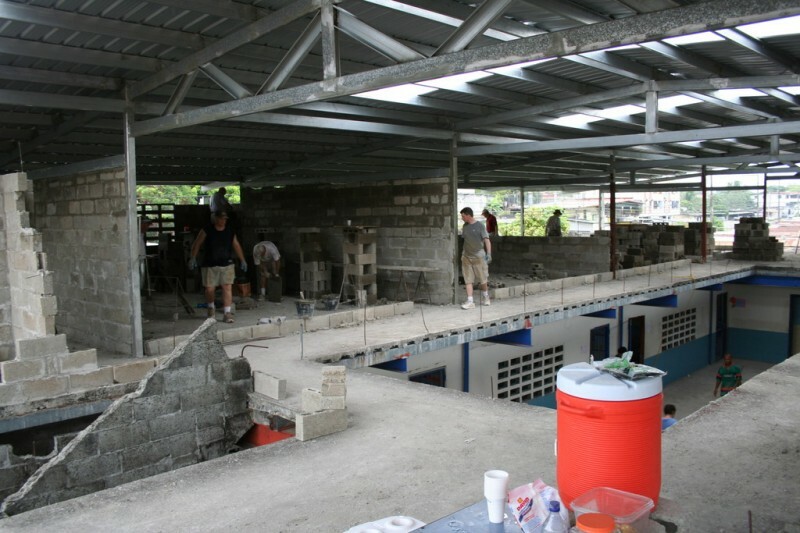 When the addition we worked on is all finished it will be stuccoed and painted like the building above and teachers and kids will fill it. That's a pretty cool thought. 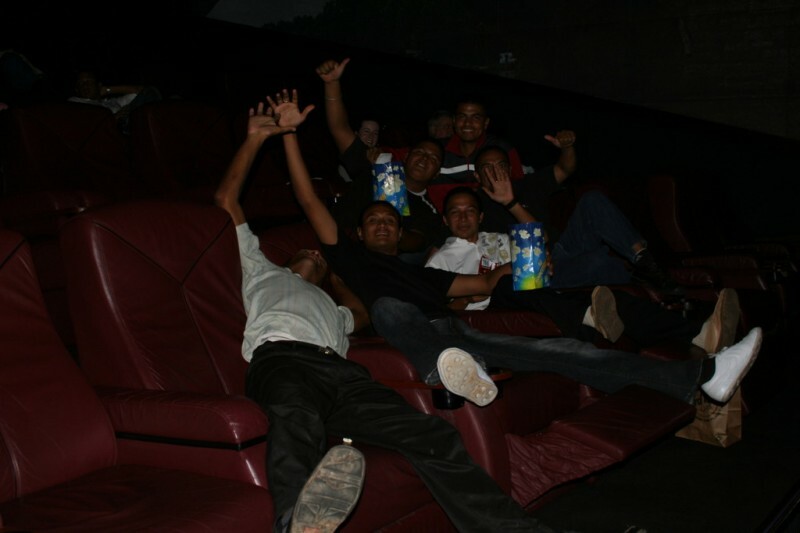 On Thursday night Bob, Stephanie, Francisco and I took the guys from Monte de Sion to the movies to see Spiderman 3, which had just come out the weekend before. We got there two hours early, so we walked down the street to the Hard Rock Cafe and got sodas with free refills and killed an hour or so. Francisco was kind enough to take a shot of the group of us for me. So, if I remembered right (and thanks to Stephanie Ward for help remembering), in the back row from left to right is Stephanie, Arsenio, Me and Carlos. In the front row from left to right is Daniel, Miguel, Jose and Pastor Bob. Those guys were some quality individuals. We still got to the theater pretty early, and I guess in Panama they don't let people in to the auditoriums very much ahead of time. They basically let you in right when the time on the ticket says, so we killed some more time in the lobby. 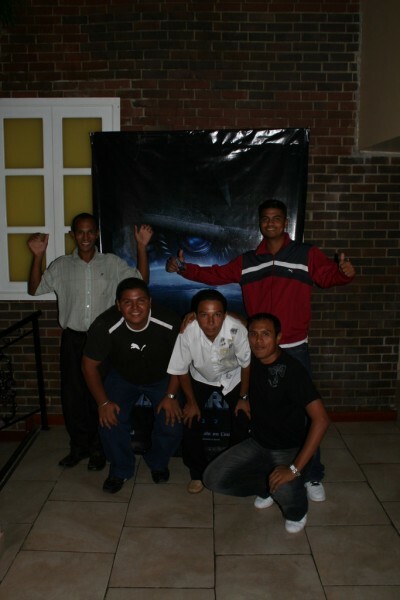 Here are the guys in front of the Transformers poster. Being a big fan of Transformers myself, I am very excited for that to come out on the 4th of July. The VIP theater is in a complex called Extreme Planet, and it's amazing. Like I said, every seat is a leather recliner and there's tons of room in every row. Plus, there are waiters that come around and will take your order and bring your food to you. You can order from any establishment in the complex which includes Dunkin Donuts and an Irish restaurant called Bennigans among others. It's pretty nice. I almost fell asleep in the comfortable seats. The movie didn't start until super late. It was either 9:50 or 10:50. I think it was 10:50. 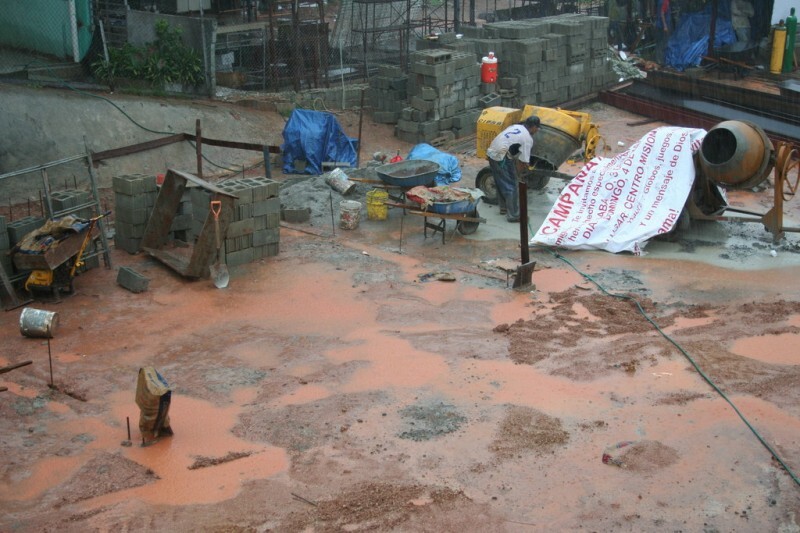 Anyway, Friday morning came super early, and when I got to the job site I didn't feel very well. I don't think it was related to staying up late, but that didn't help. My stomach felt gross, so I only worked for about an hour before quitting for the day. 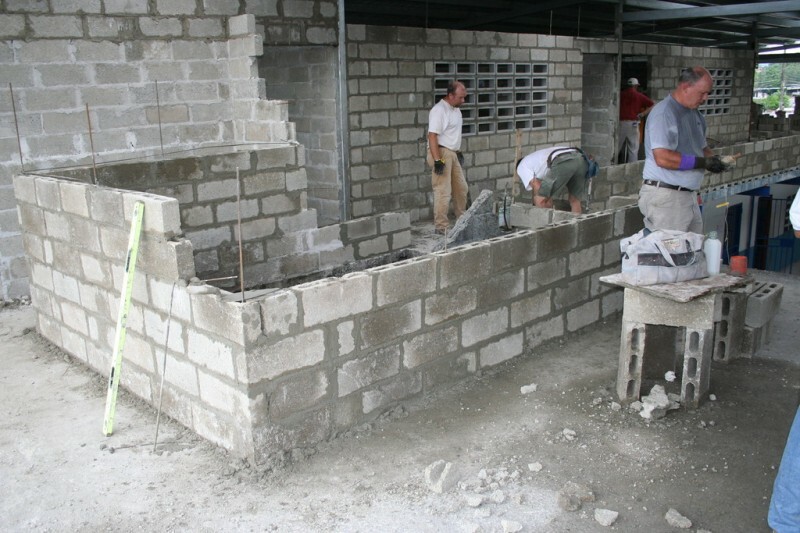 This photo shows a couple of the last walls we worked on on the trip. This was near the end of the day on Friday, our last day. While I wasn't feeling well I spent most of the time in the sanctuary of the church, and every once in a while kids would come through during their breaks or when they got out of school. For a while they were all asking for our autographs. They were really neat. This girl is one that one of the guys on our team sponsors, and she drew this picture for Sherry Swee, I think. Sherry took this photo for me. 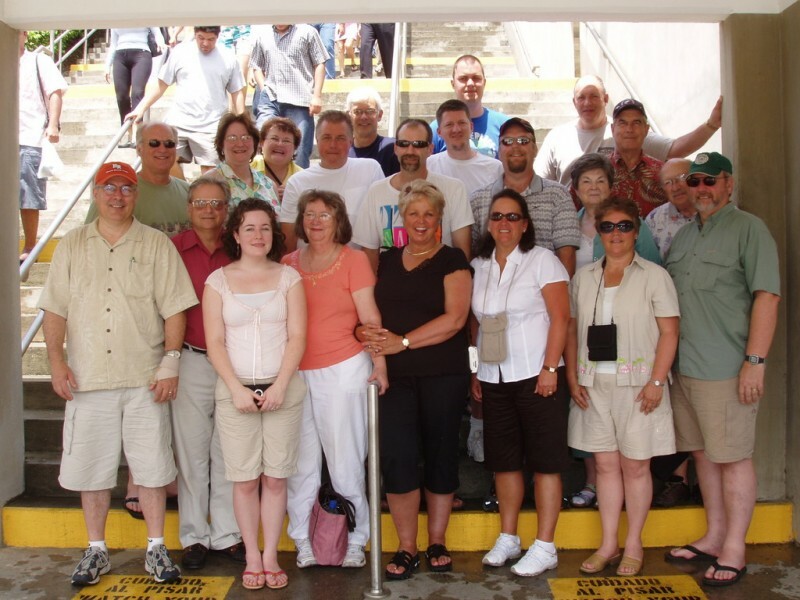 This is a photo of the whole team on the steps of the Miraflores Visitor Center at the Panama Canal. This is sort of out of order because I got these last few photos from Dave and Debbie Martin, who collect everyone's photos to put on a DVD to pass out later on. I think the missionary Rod Boyd must have taken this photo. So, about a week ago I got my new sponsor packet, and I am about to send it back to officially sign up. But it was really neat to get to meet Nihel in person. He and I were both pretty shy at first, but hopefully we will get to write to each other and get to know each other and next time I'm in Panama we will have some things to talk about. These kids are what it's all about. Many of those who go to these Christian schools are not believers when they come, but they are introduced to Jesus by their teachers and then they take the good news back to their parents. 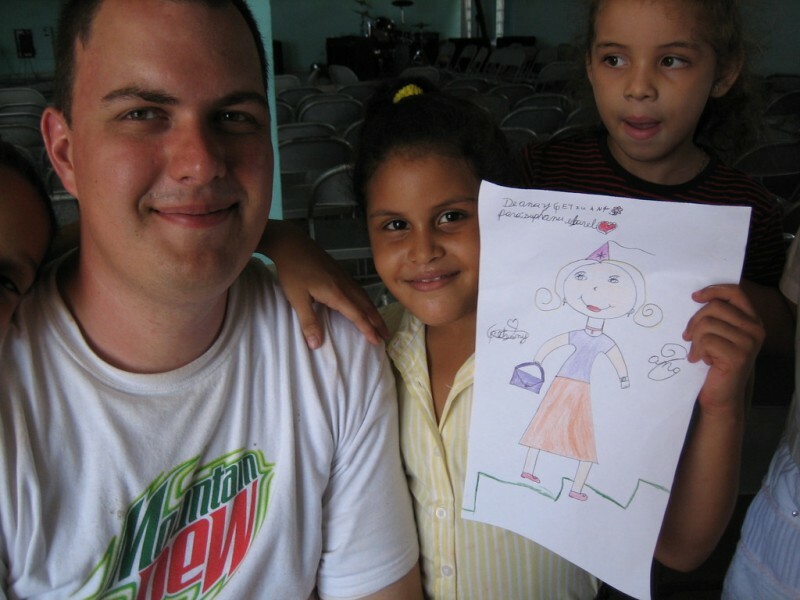 One sponsorship often changes the lives of a whole family. It's pretty cool. Well, that's it. Thanks for reading.